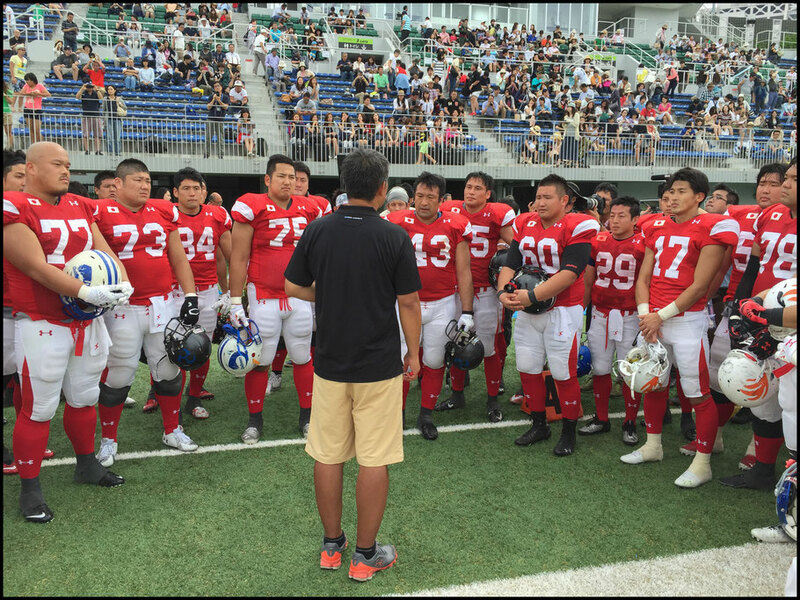 Just what Japan coach Kiyoyuki Mori will have learned from his side’s 58-0 drubbing of “Team Hope” at Fujitsu Stadium in Kawasaki, Japan on Sunday is anyone’s guess. 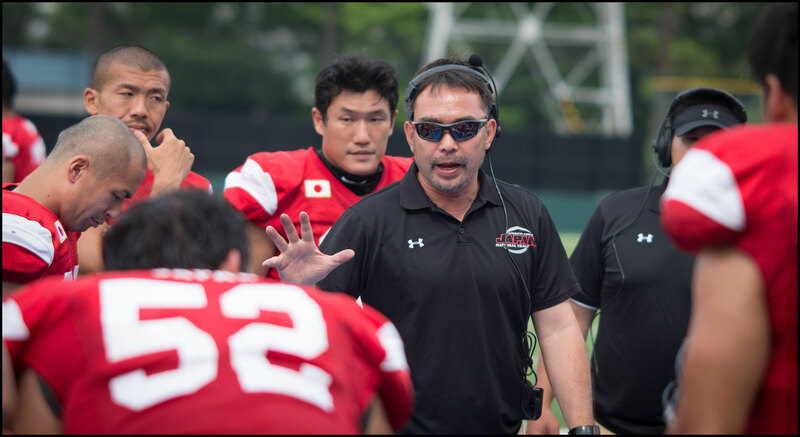 Although billed as a final selection decider before the 50-year-old coach whittles down his squad before next month’s World Championship, the low-key affair was little more than a practice session. 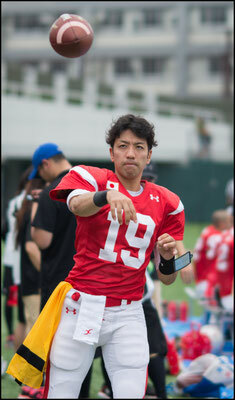 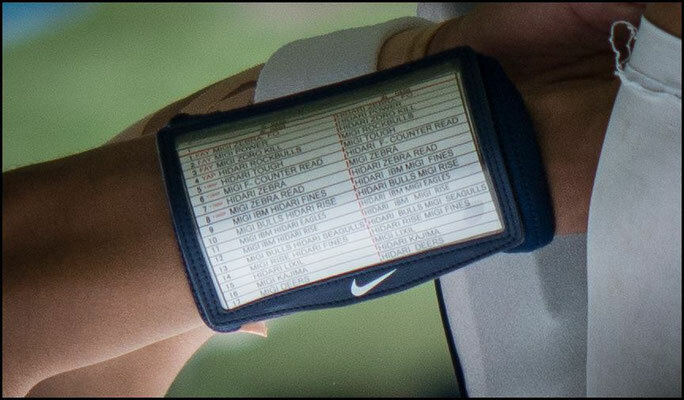 With QBs in bibs not allowed to run or be hit Mori can’t have seen anything that would help decide how many signal callers he should take to Canton. 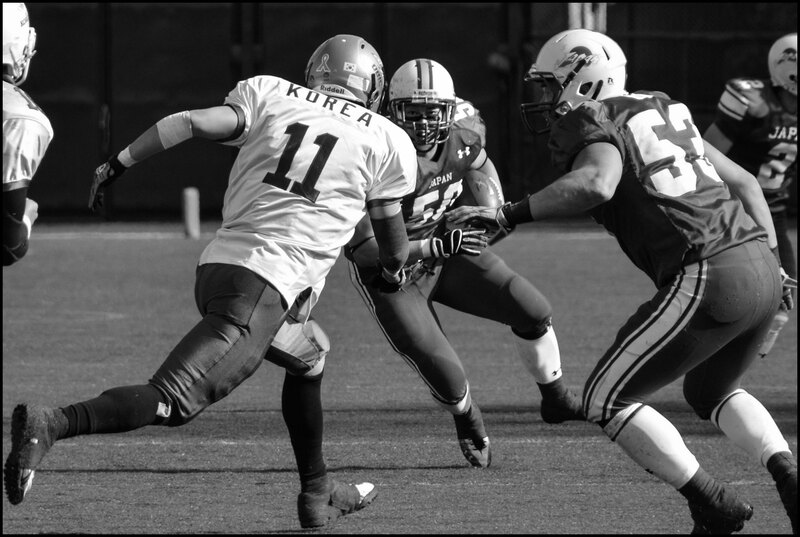 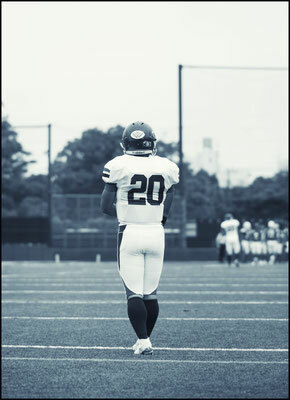 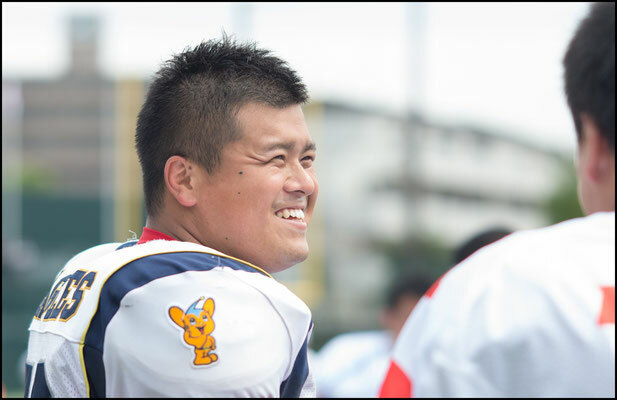 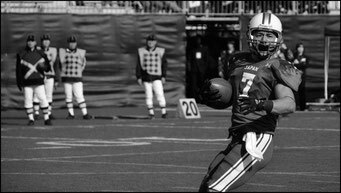 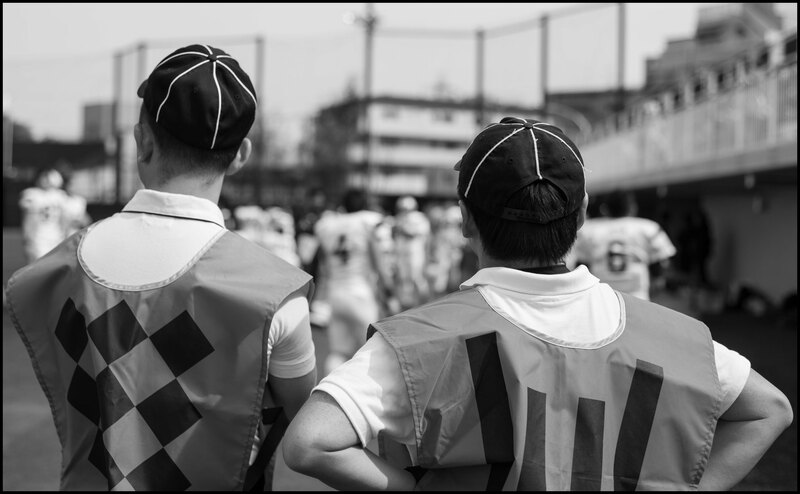 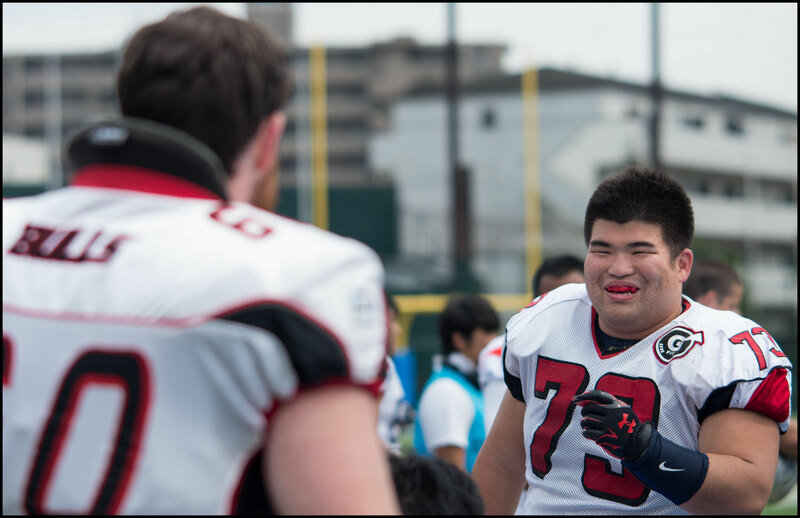 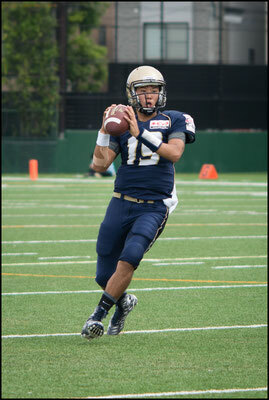 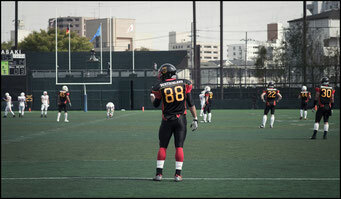 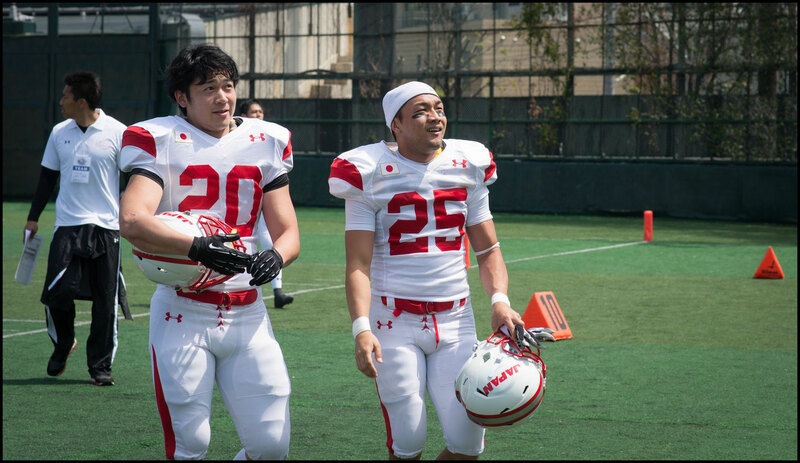 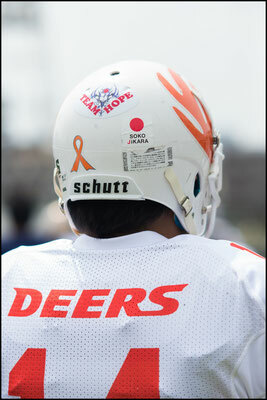 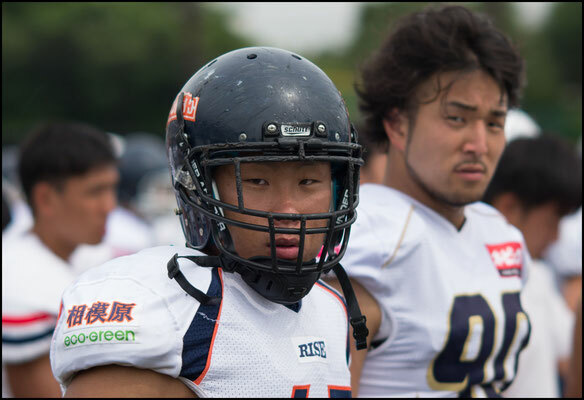 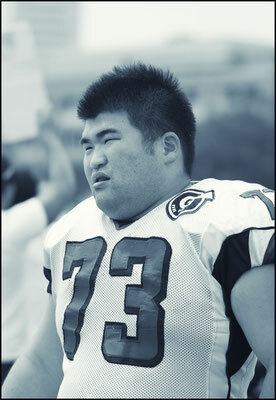 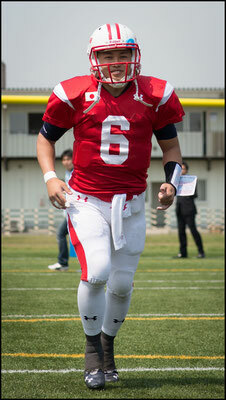 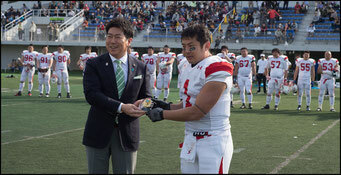 The tone was set on the very first series with Team Hope (a collection of X-League and Keio University players) going three and out with a dropped ball and two overthrown passes. 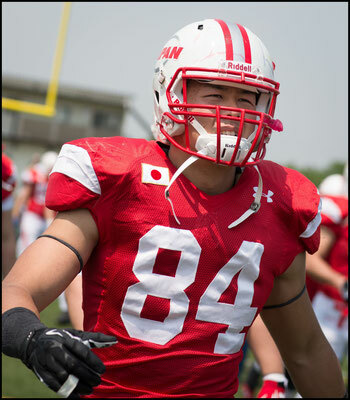 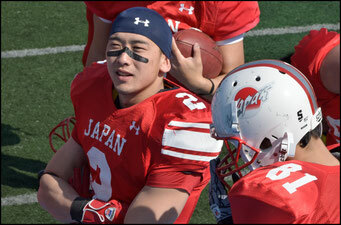 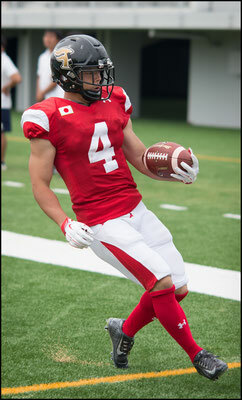 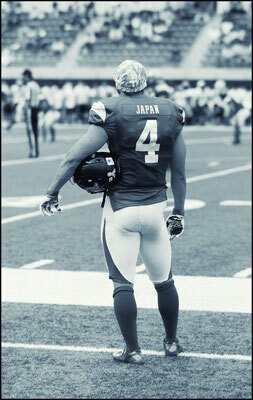 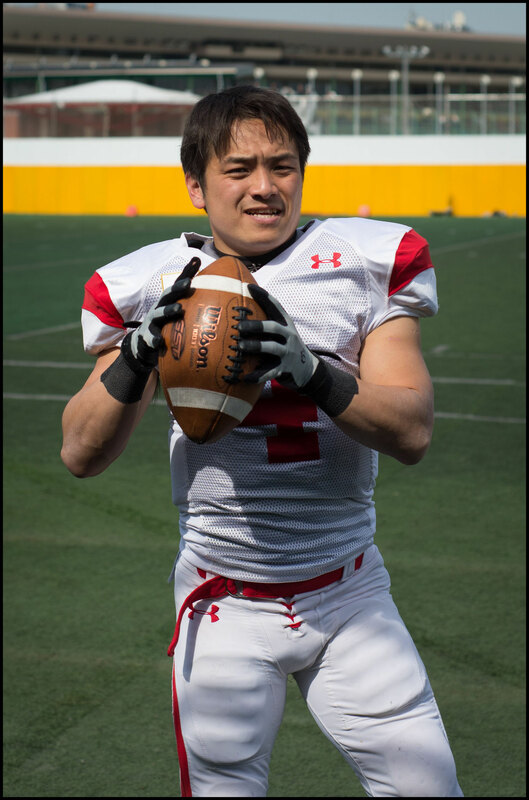 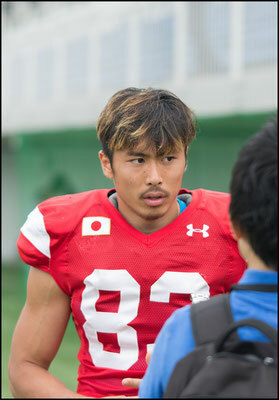 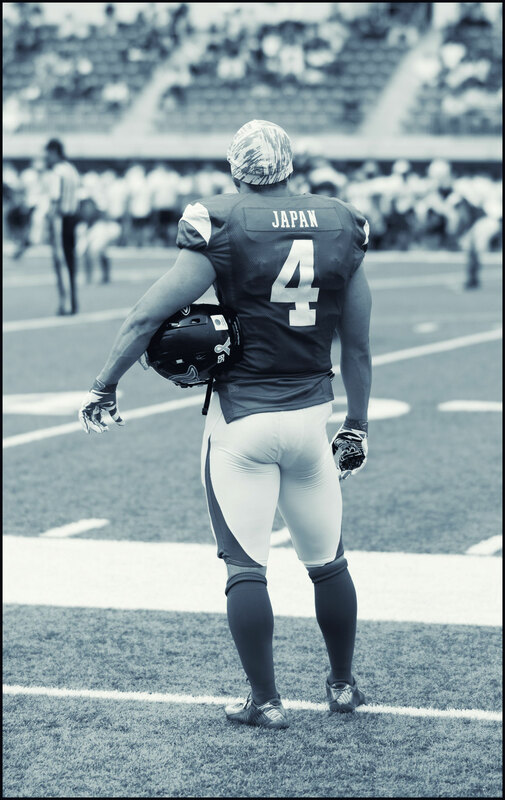 Japan got on the scoreboard straight away with wideout Yuta Hayashi taking a short pass in for a TD on their first series. 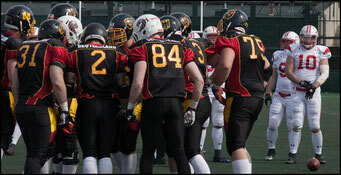 Team Hope managed to string good plays together at several stages but five interceptions (including two pick sixes) doomed whatever chances they had. The half full stadium was almost entirely on the national team’s side and at times it seemed like the game was little more than a confidence booster ahead of the World Championship. 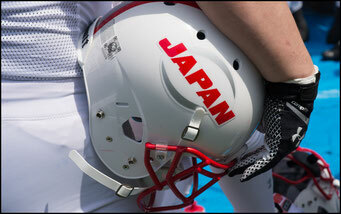 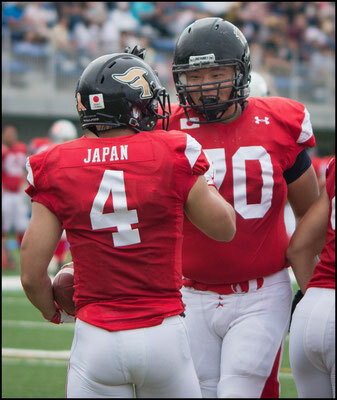 24-0 up at half time, Japan added another 34 points without reply after the break, as their opponents tired. With holes looking like they were opened by Moses starting to appear, Japan was able to score from distance on the ground as well as through the air. A blocked extra point was probably as good as it got for the “away” team but with nothing to play for, a padded run out and no injuries meant, all things considered, it was a successful afternoon. 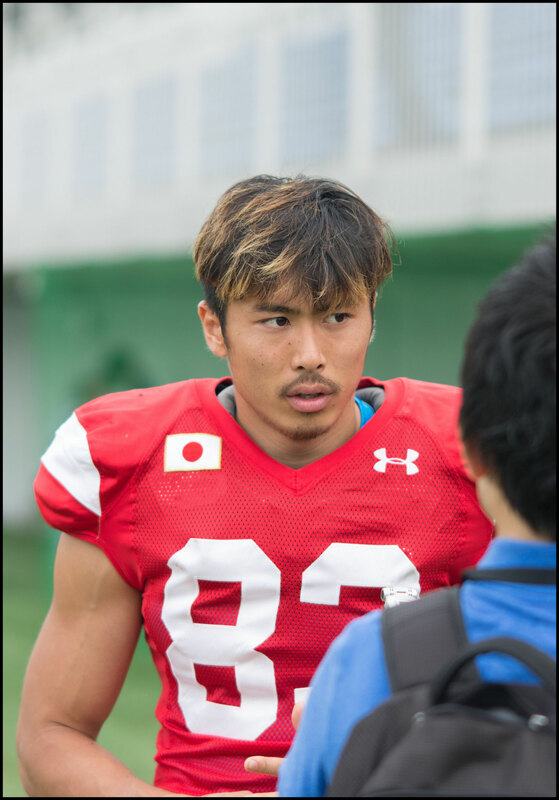 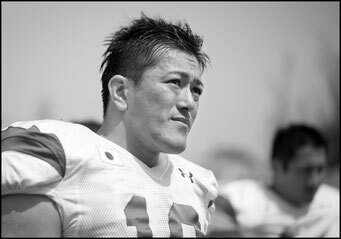 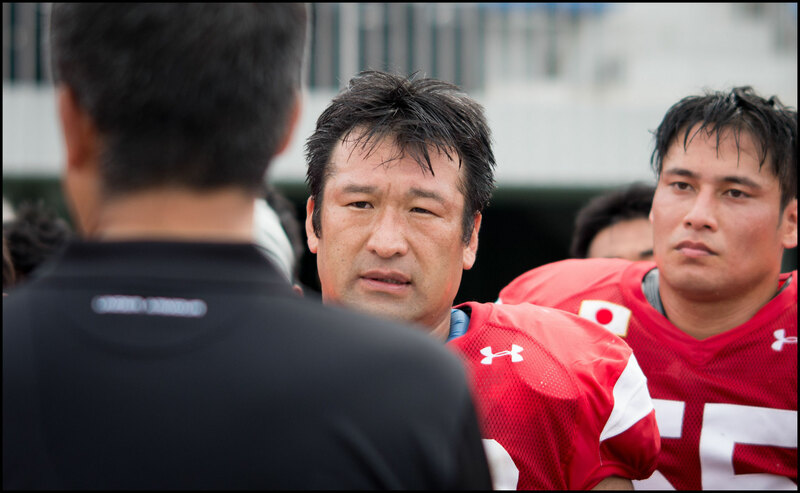 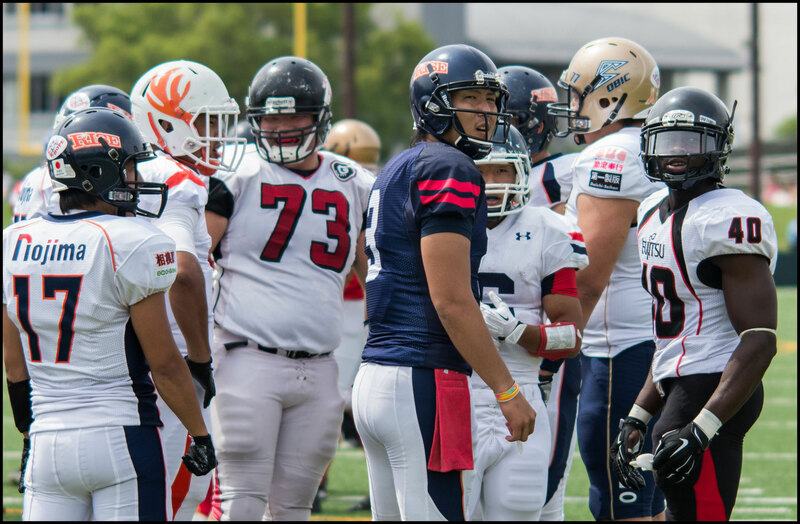 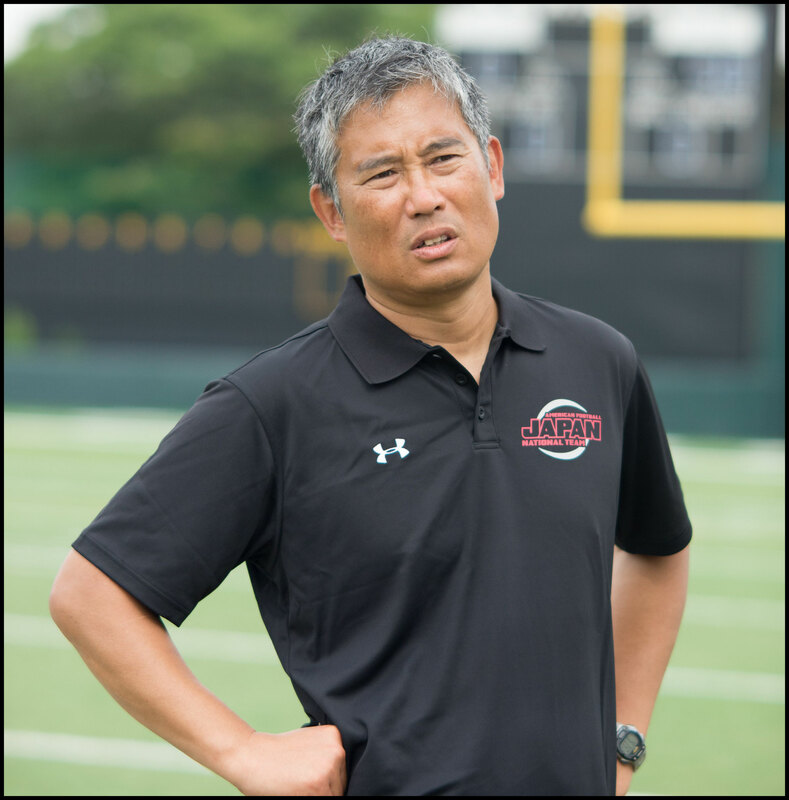 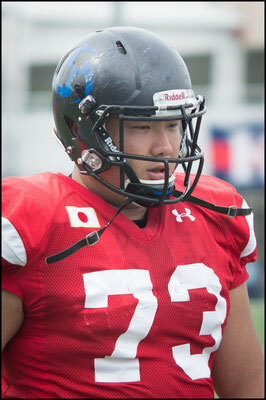 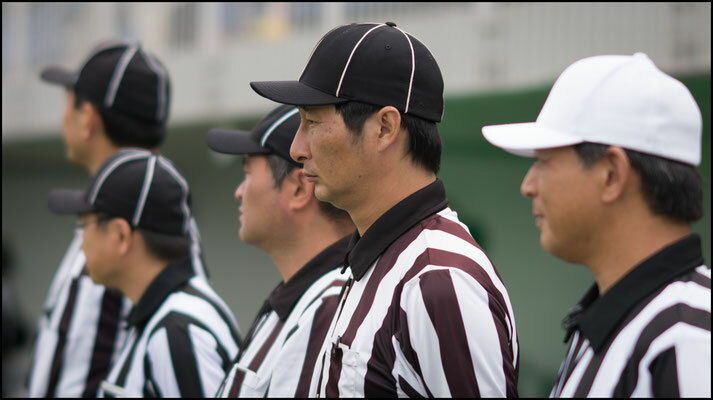 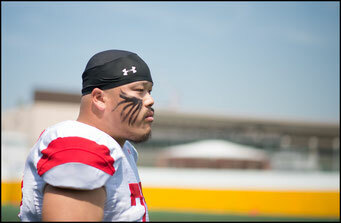 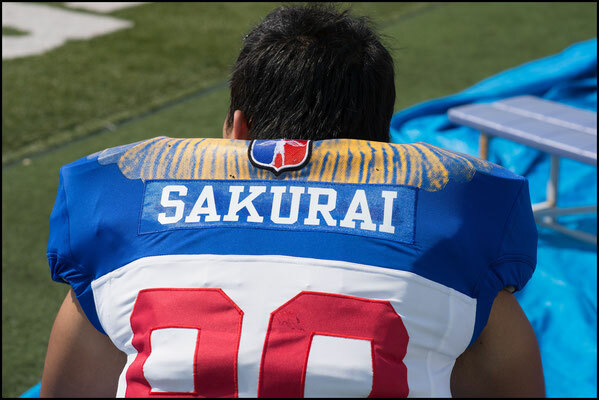 After the game Mori chose to ignore the score and focus on what his team needs to improve, saying the receiver’s missed blocking assignments and wrong routes will be much more costly against the USA’s (Japan’s likely first opponent) secondary. The coach wasn’t too downbeat about the errors though, attributing them to the fact that several players aren’t regulars in the national side and as a result miscommunications occurred when signals were being conveyed. 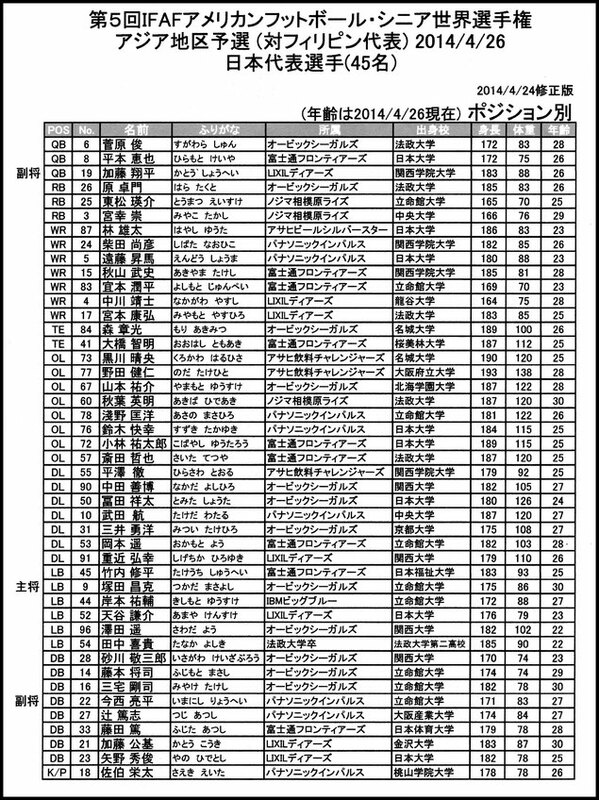 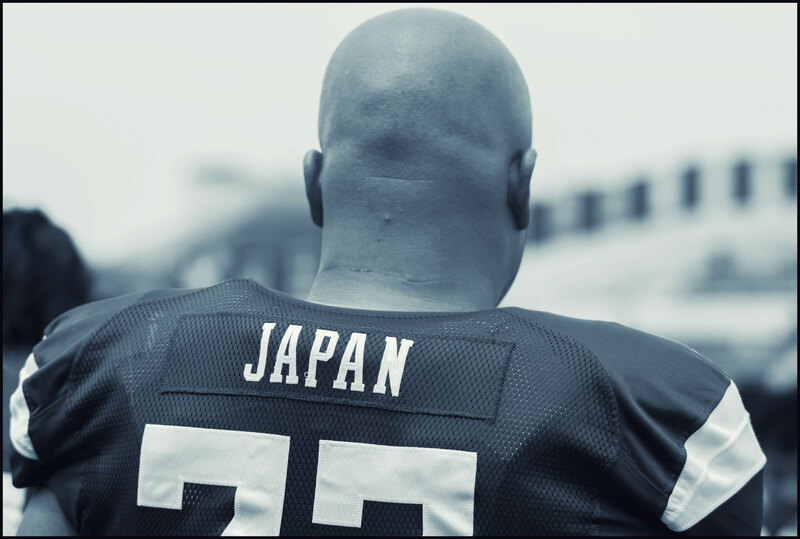 Later today the final roster of 45 will be named and next month Japan heads to Canton hoping to reclaim the title it last won in 2003. 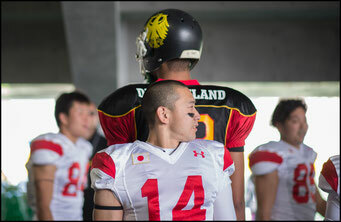 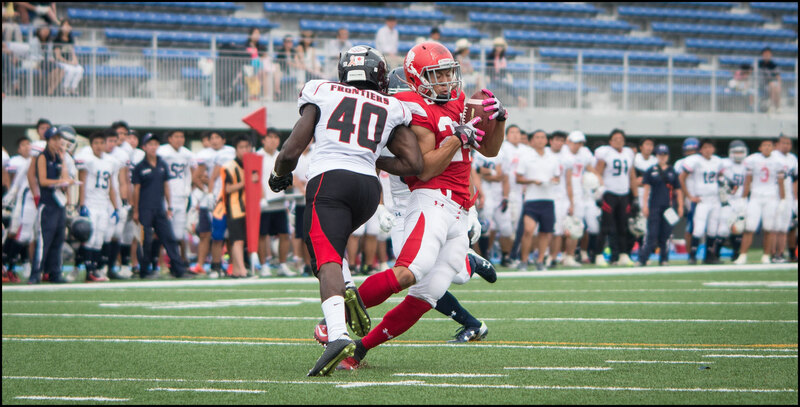 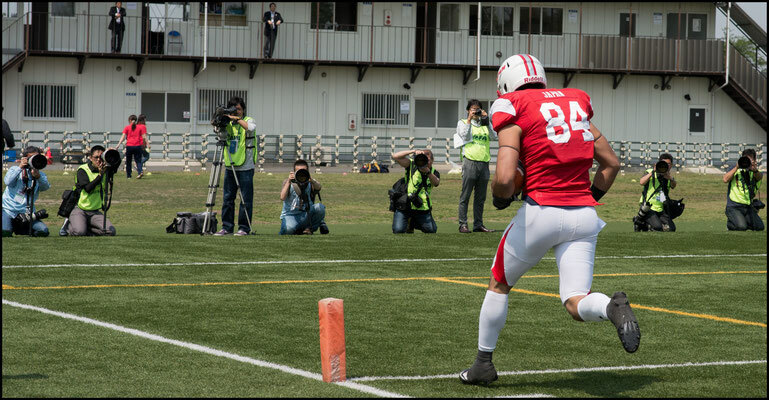 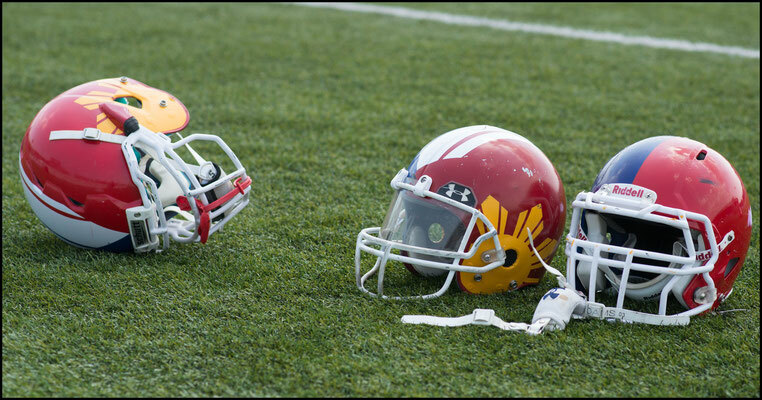 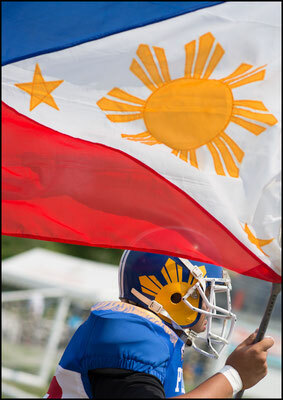 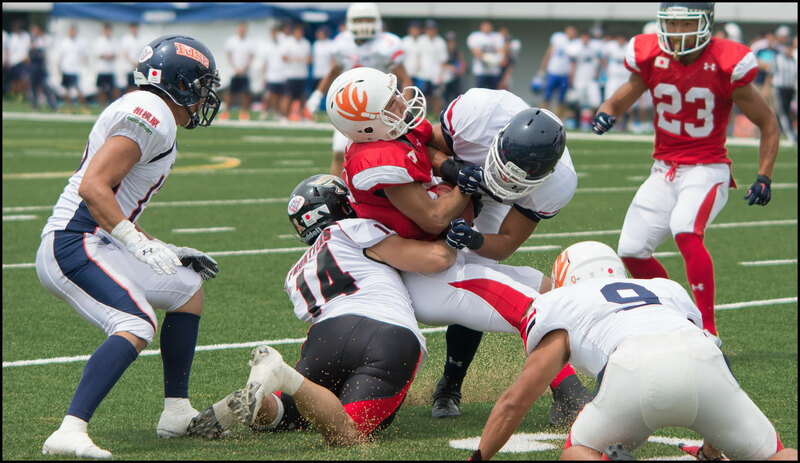 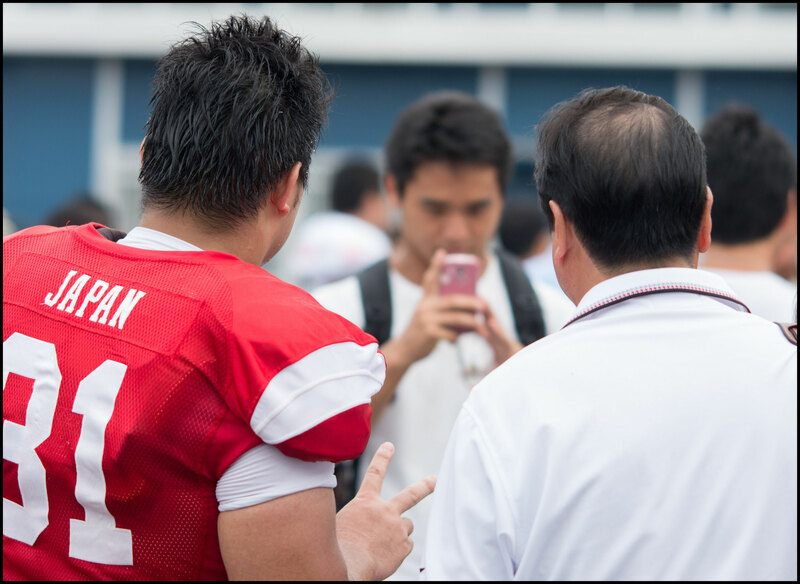 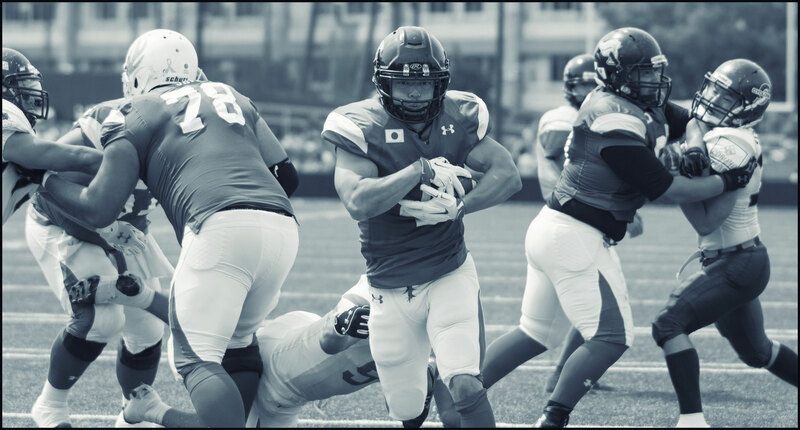 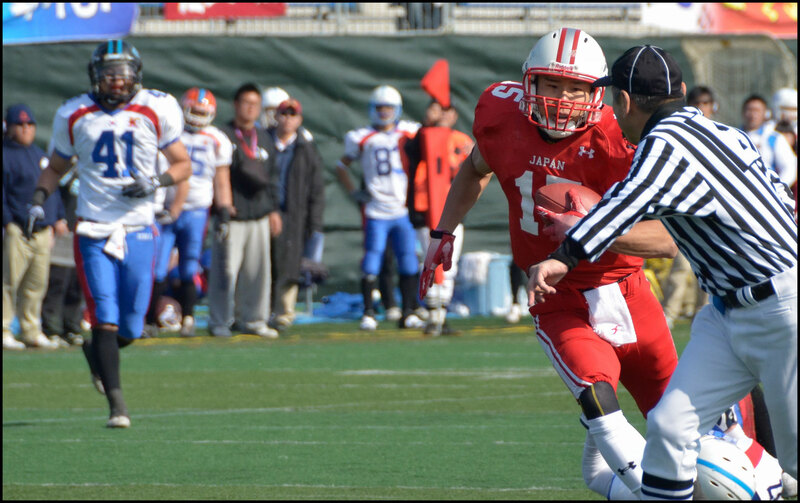 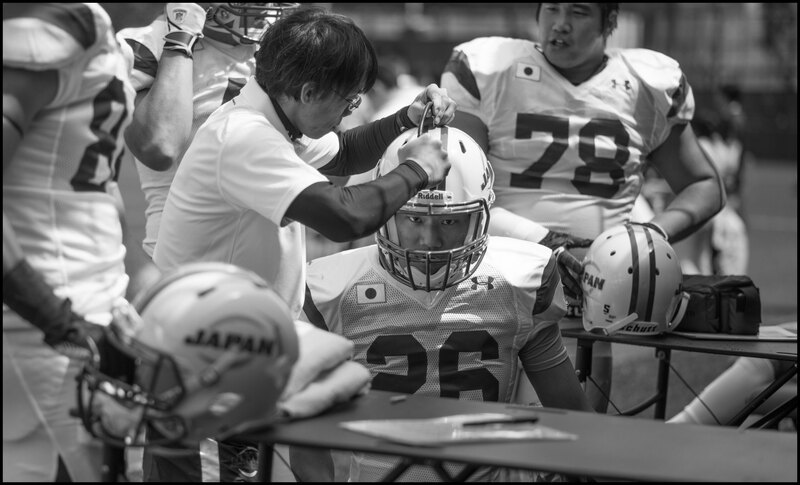 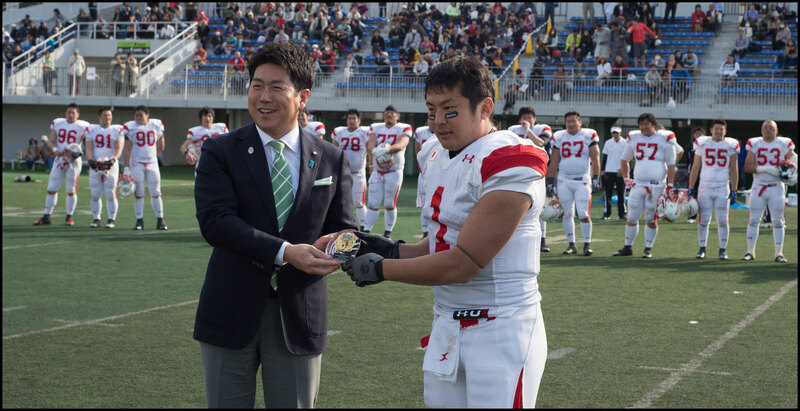 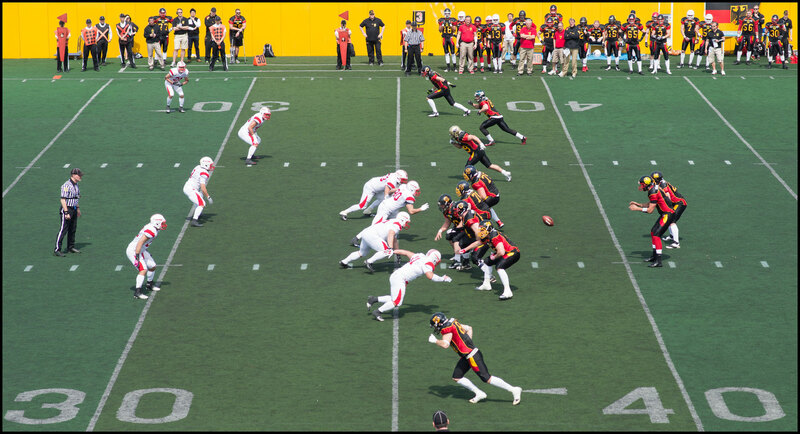 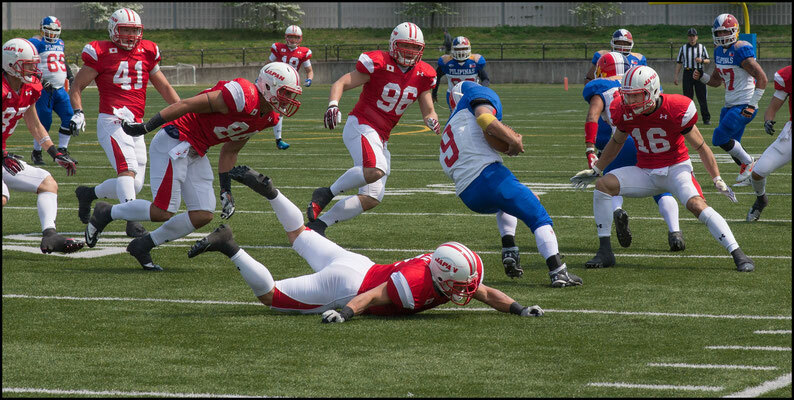 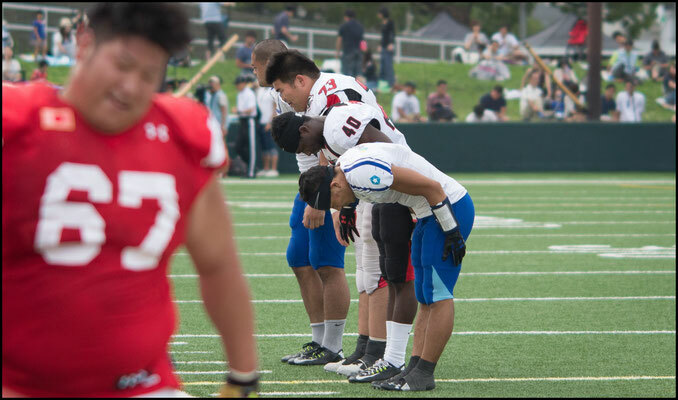 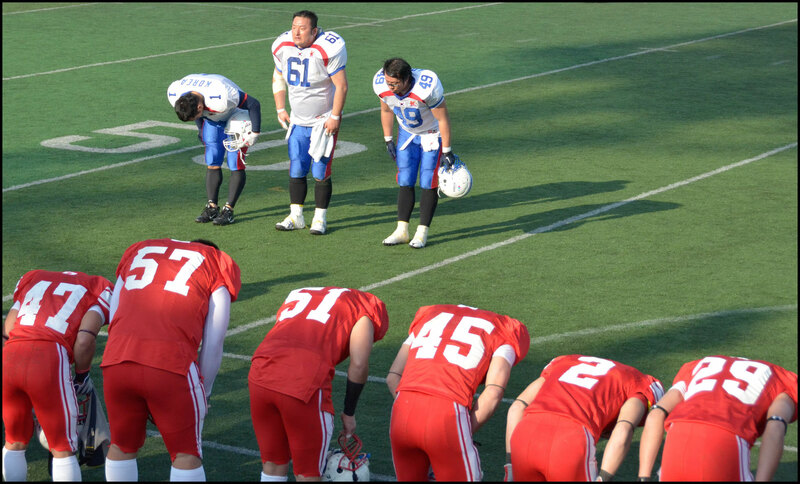 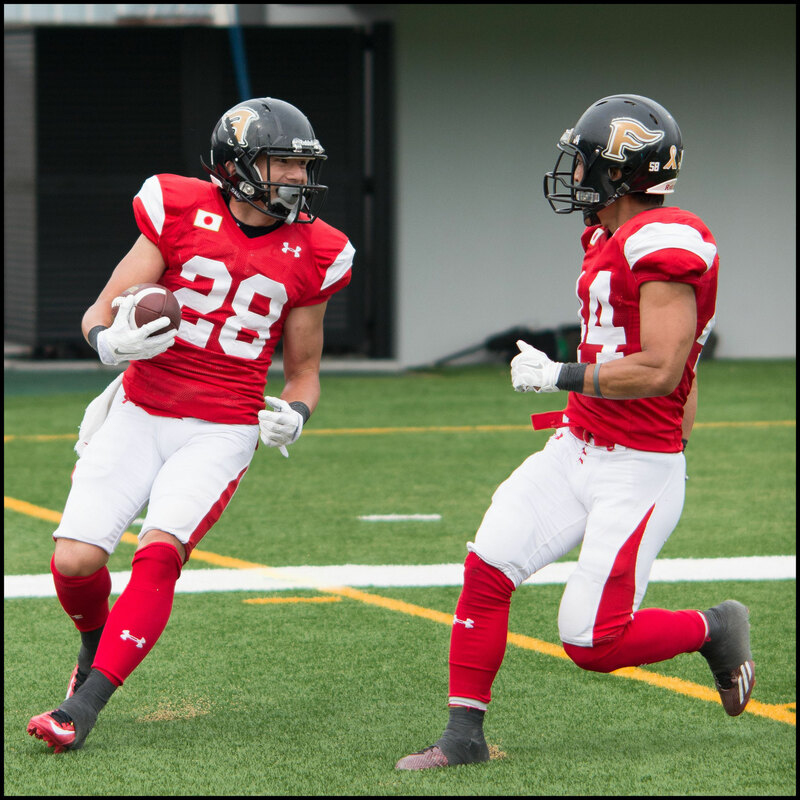 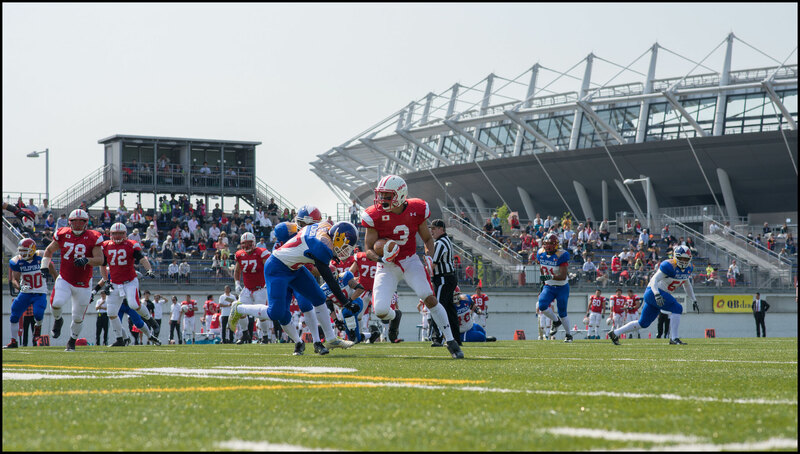 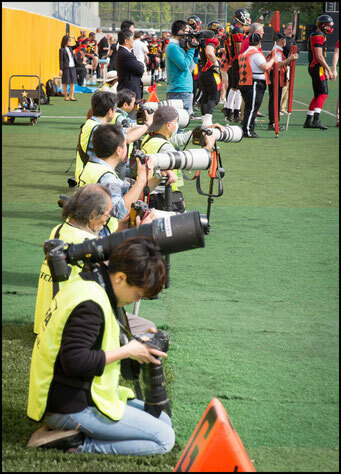 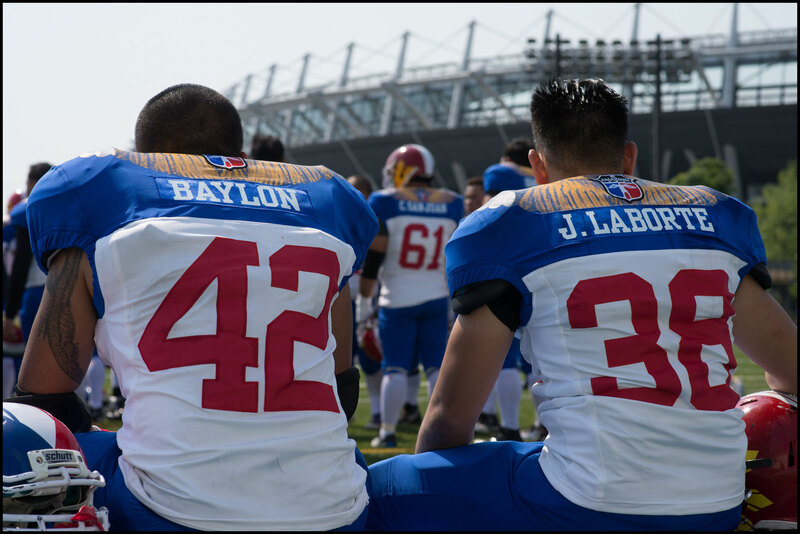 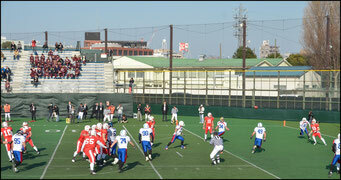 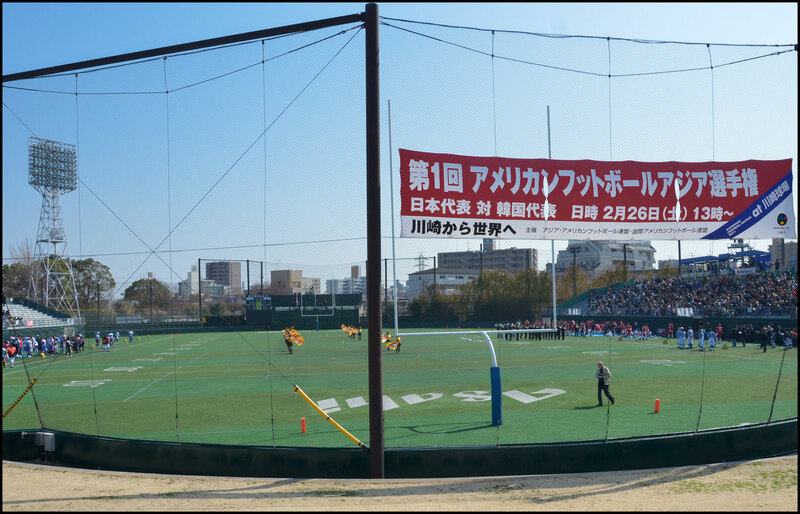 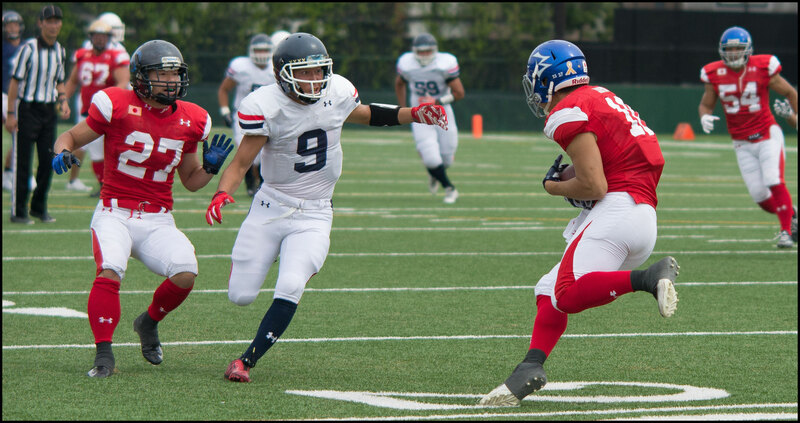 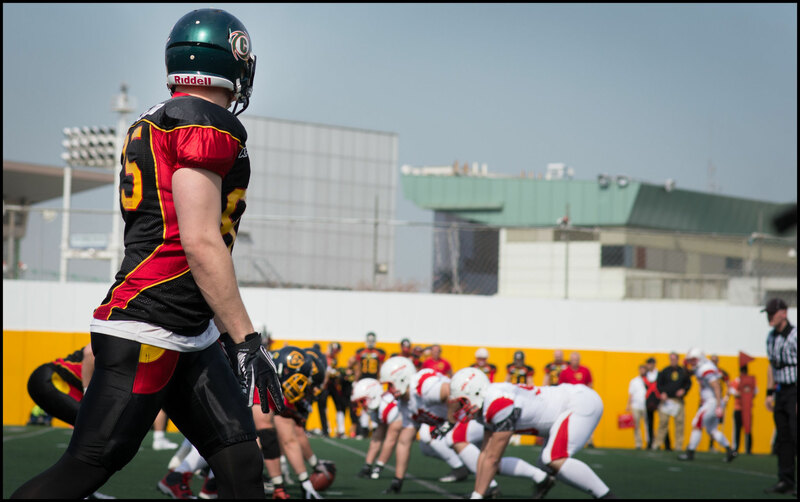 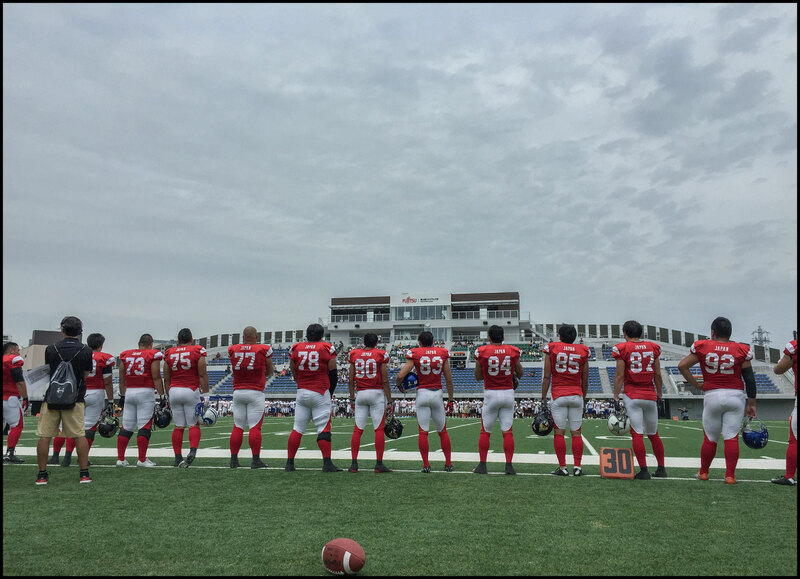 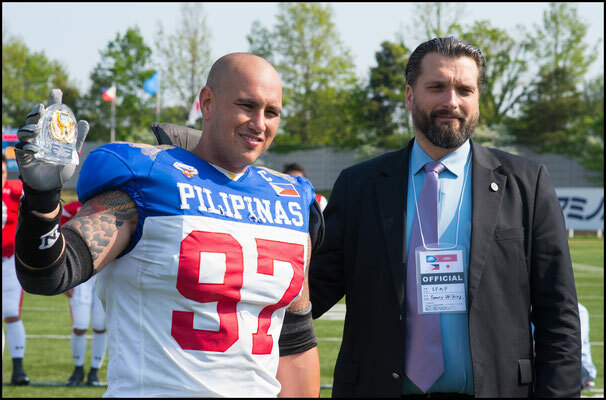 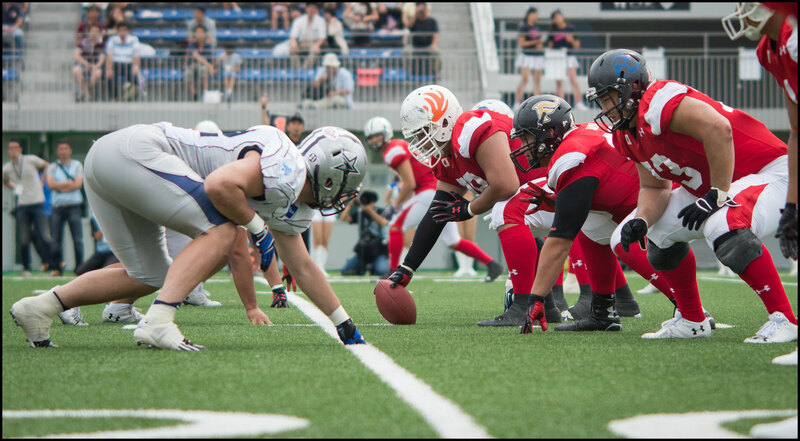 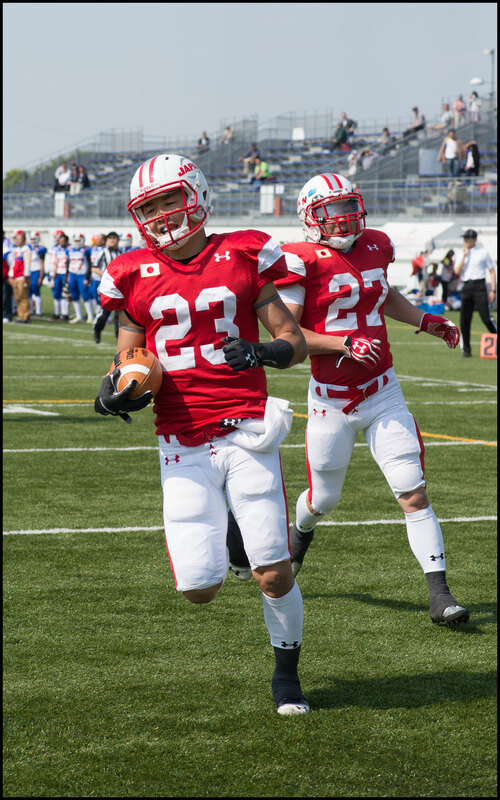 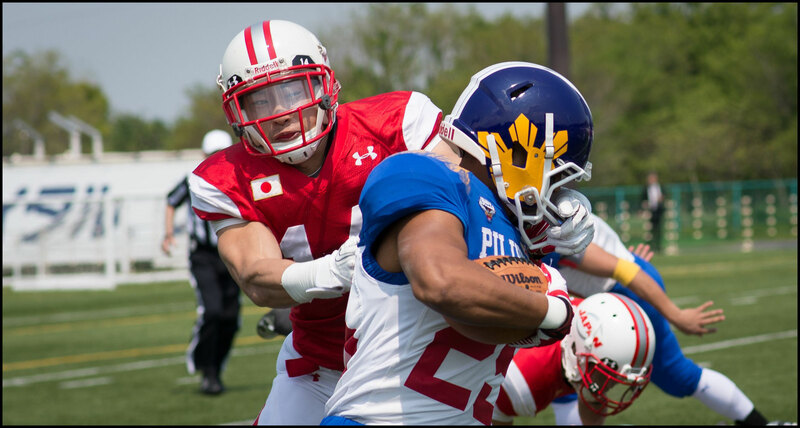 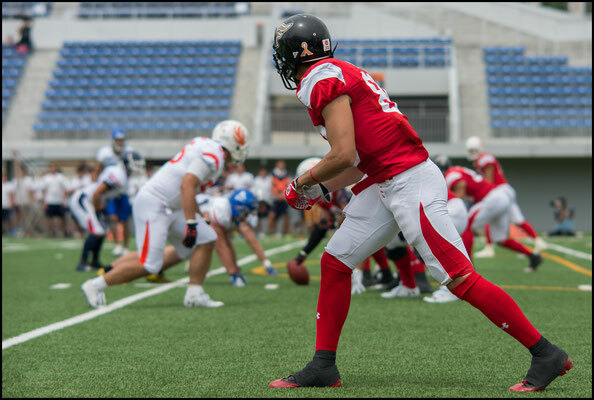 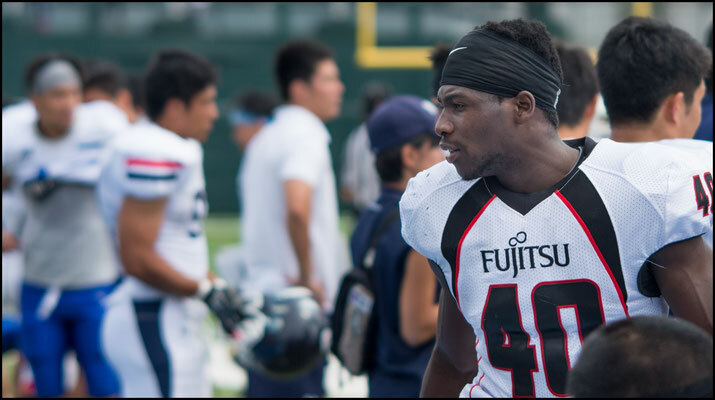 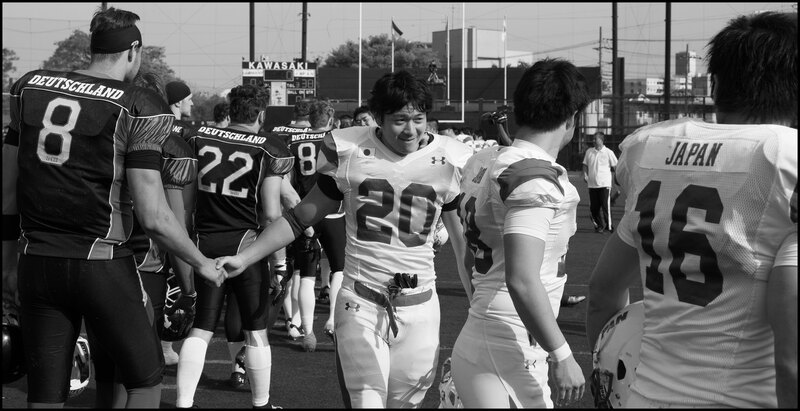 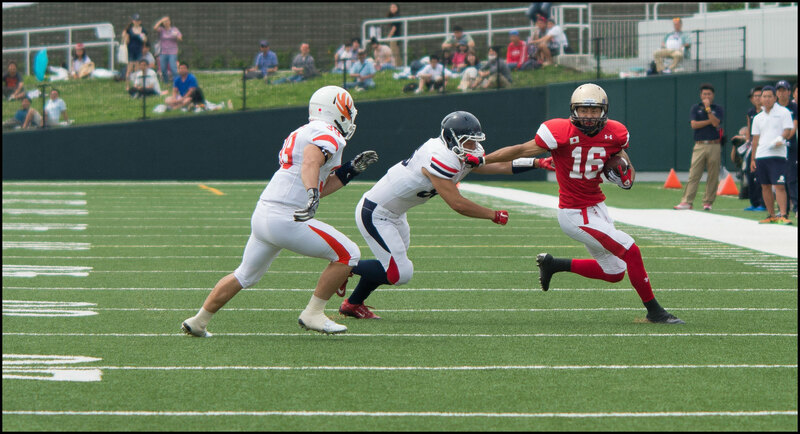 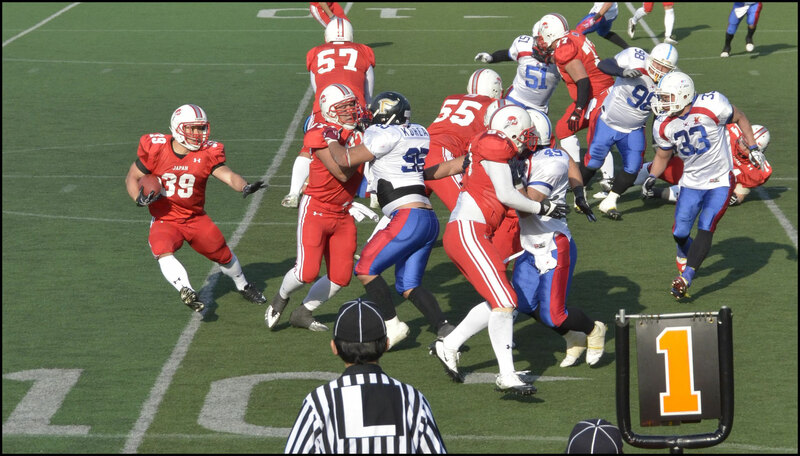 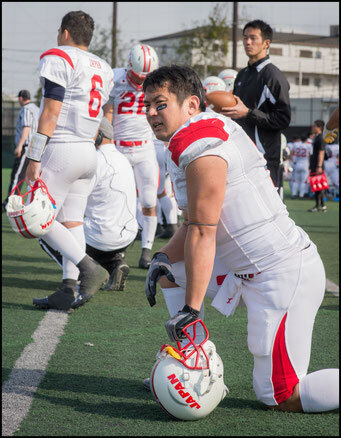 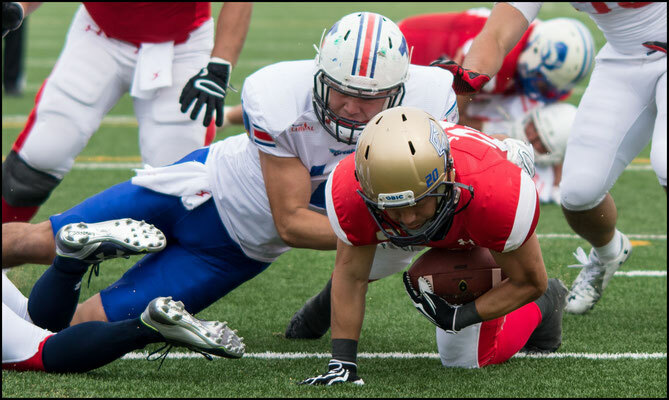 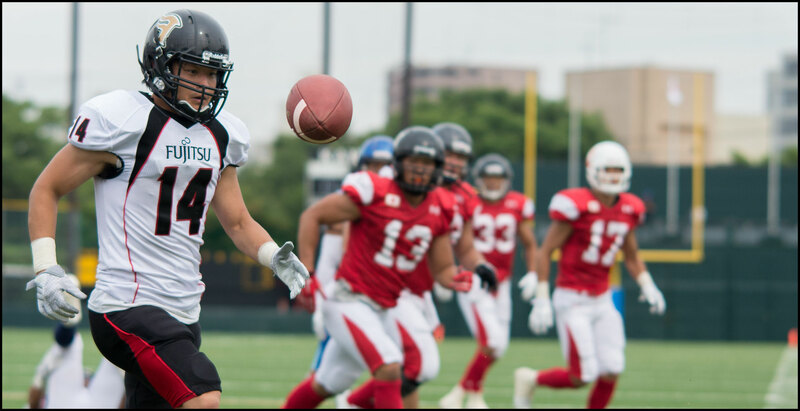 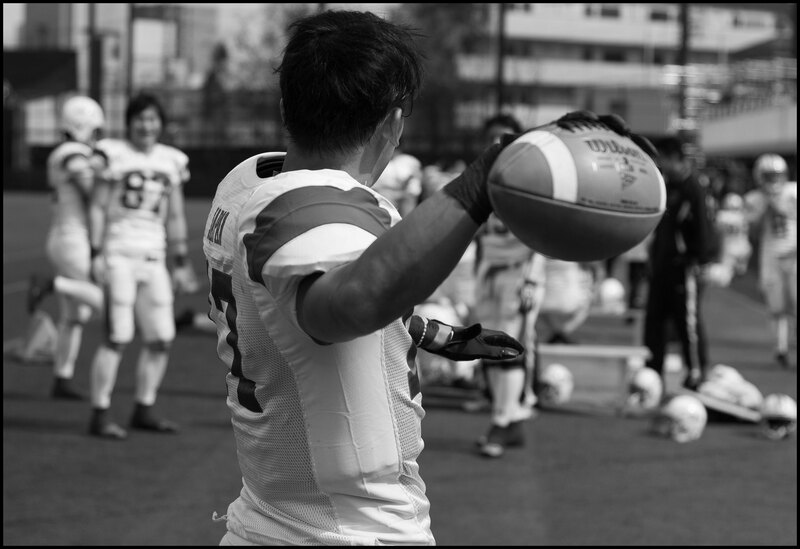 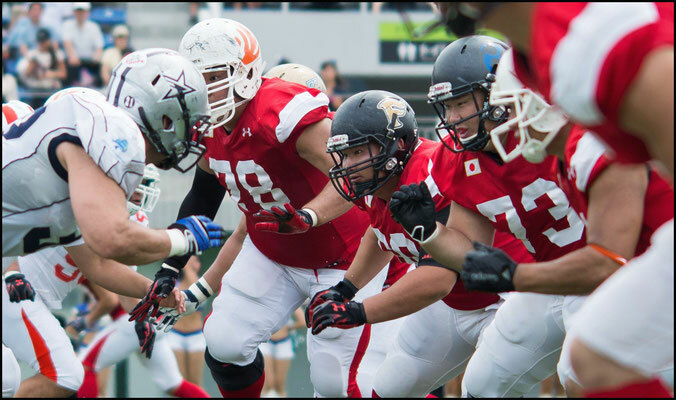 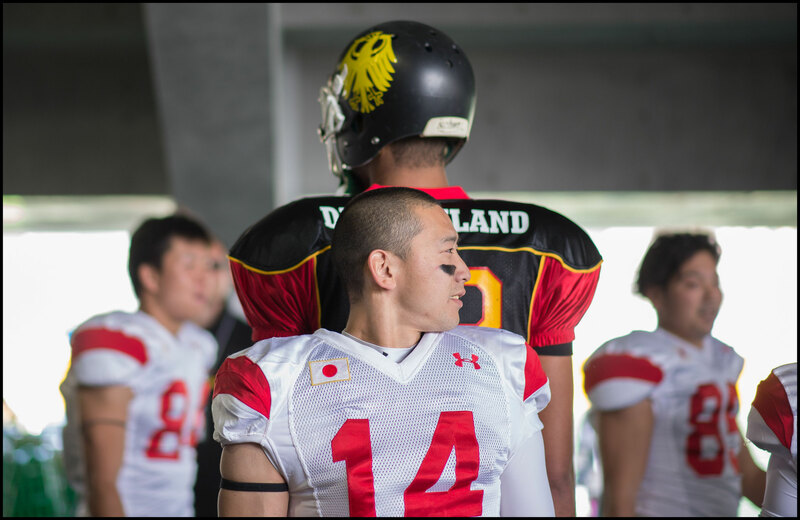 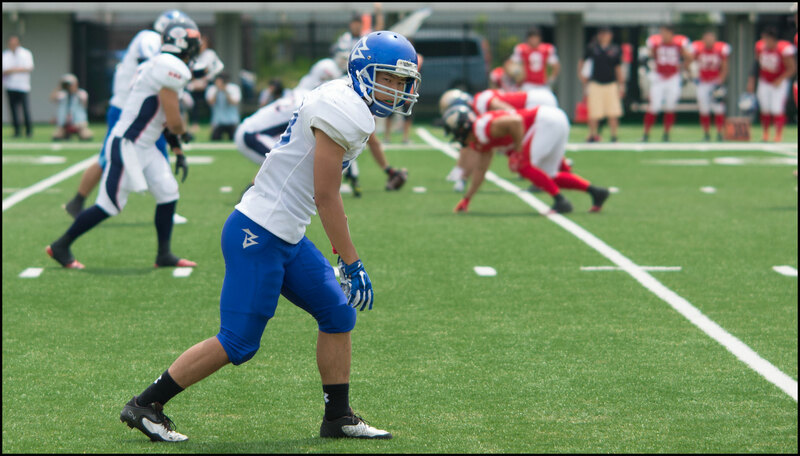 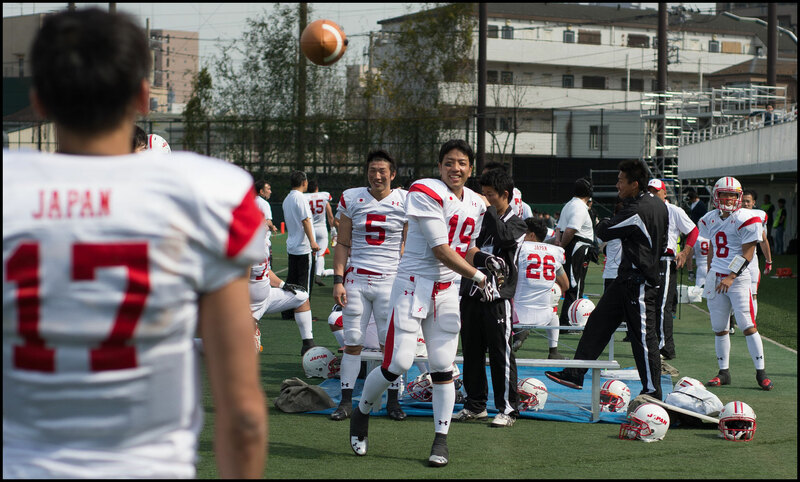 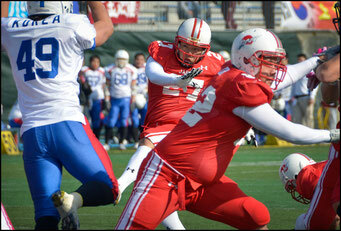 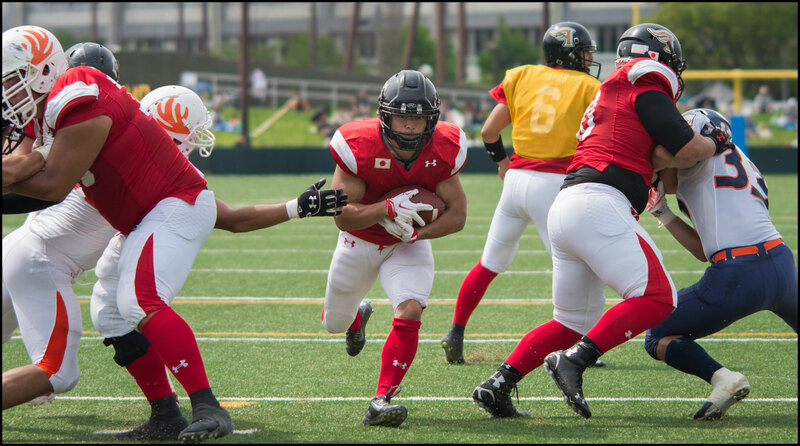 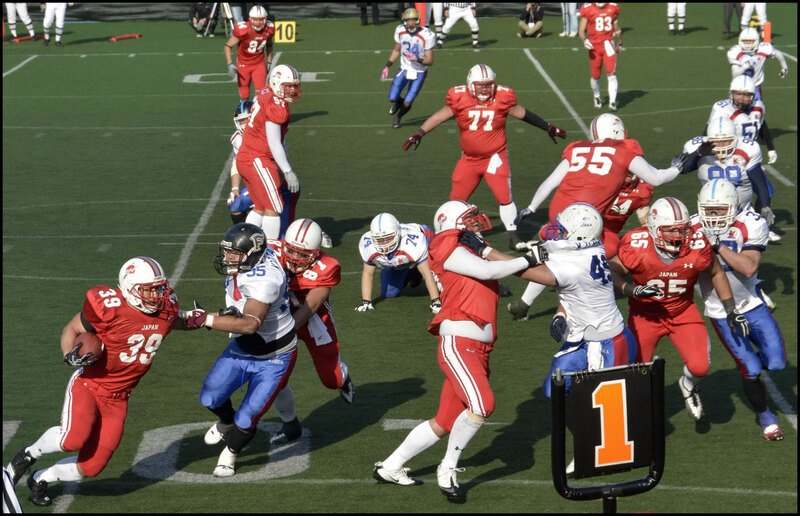 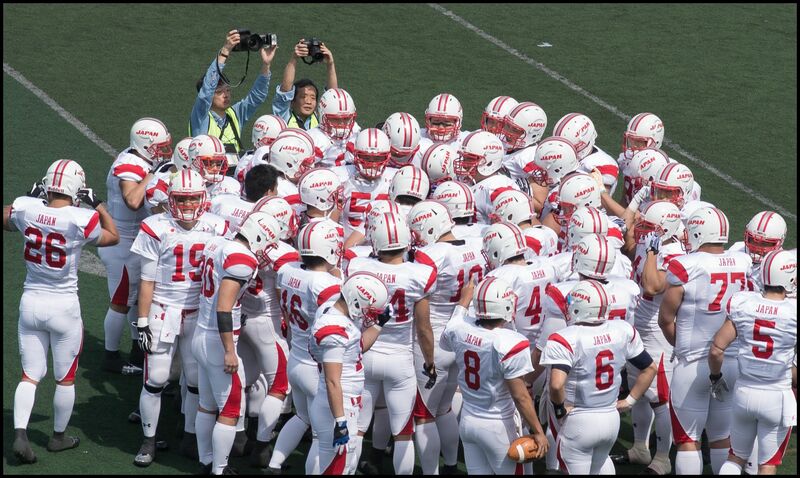 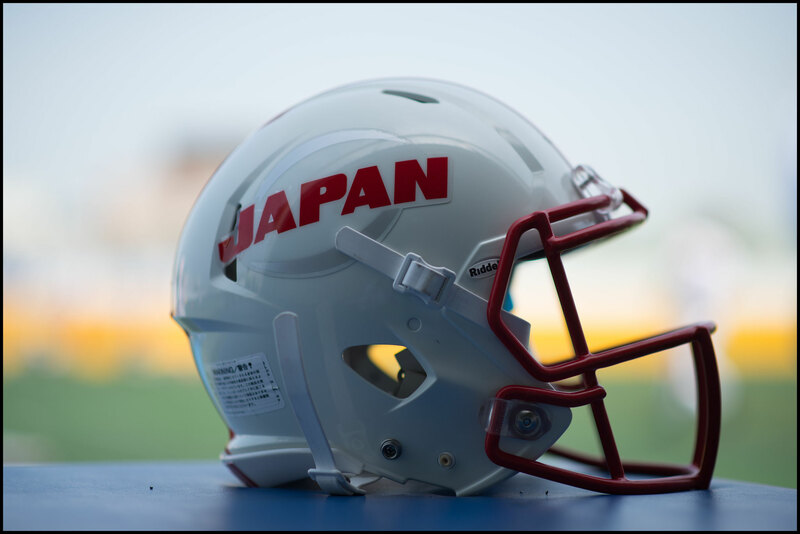 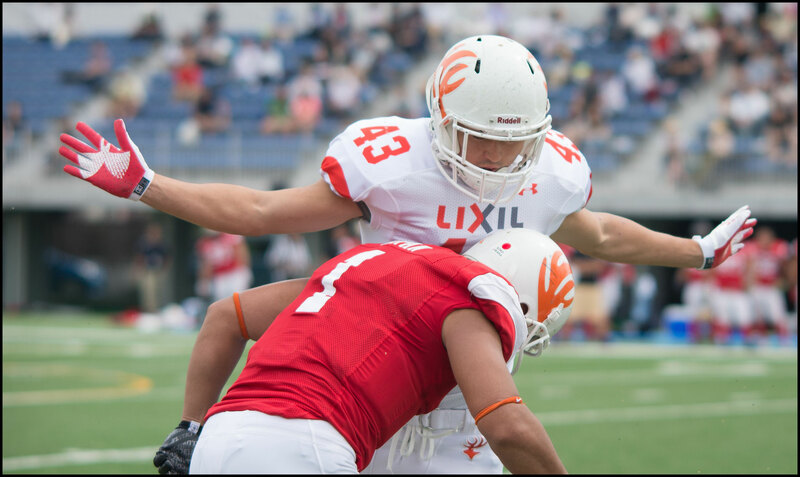 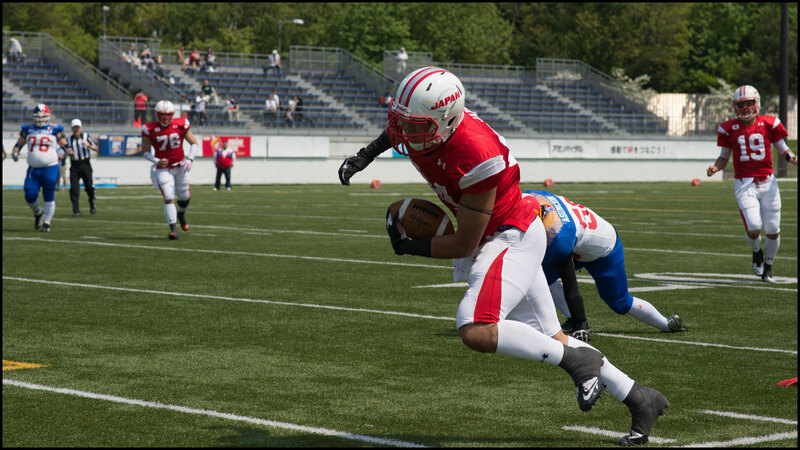 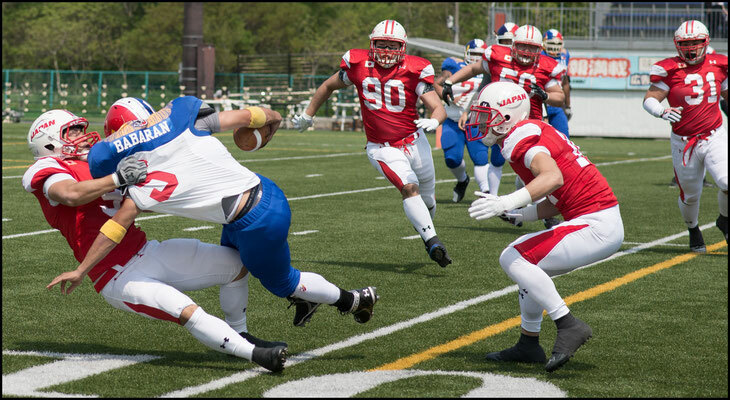 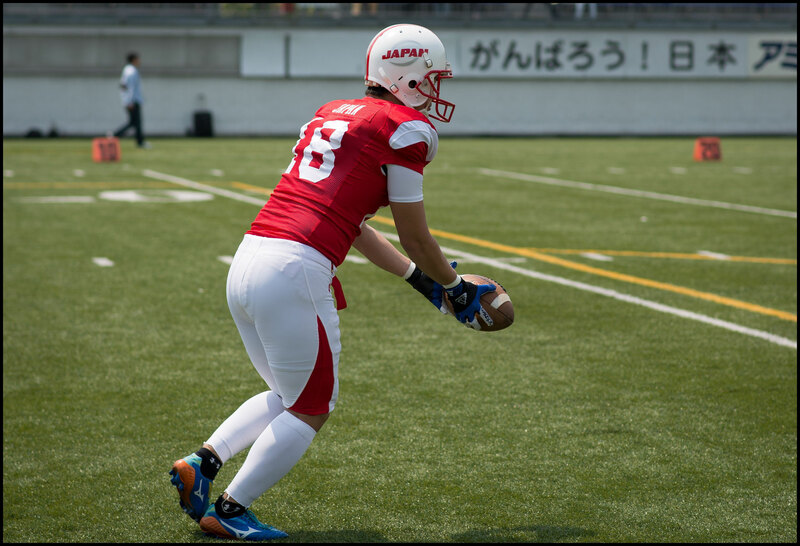 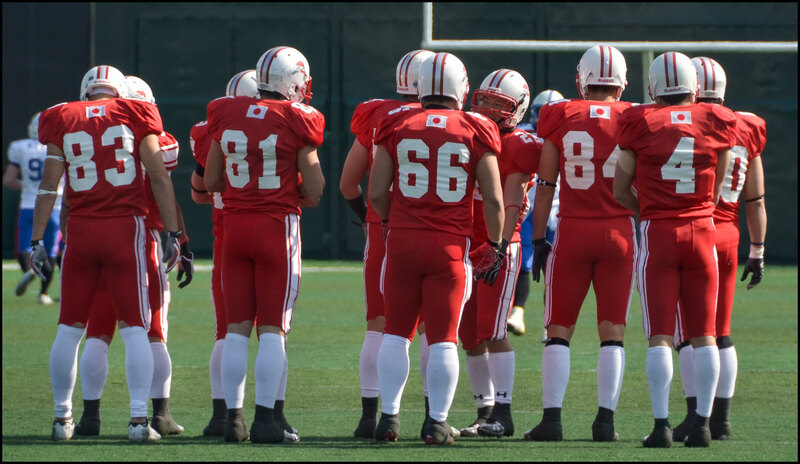 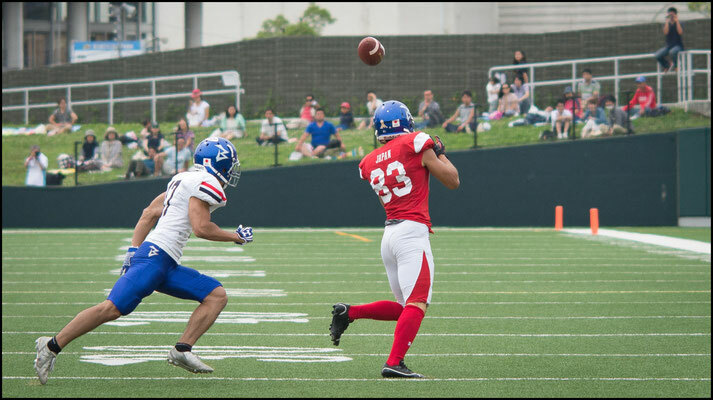 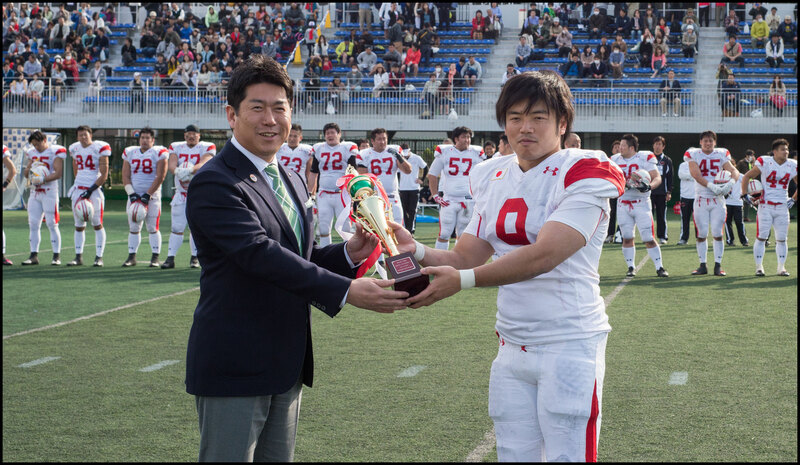 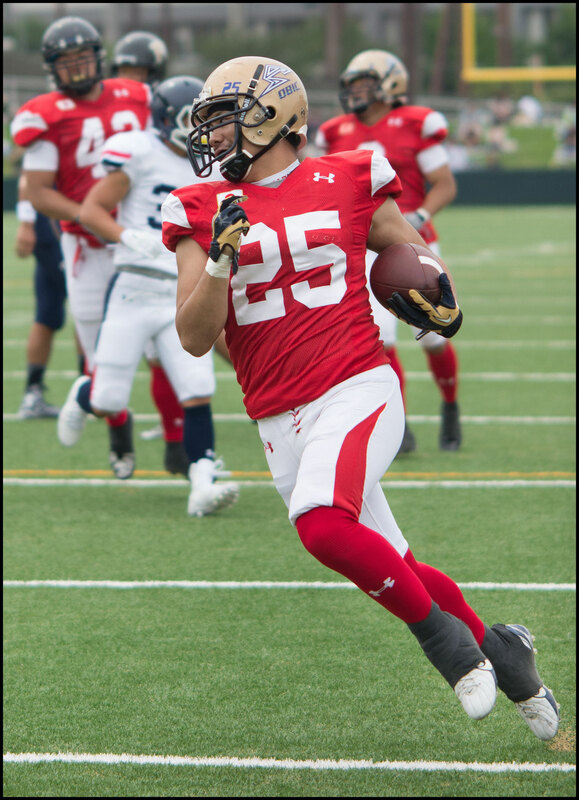 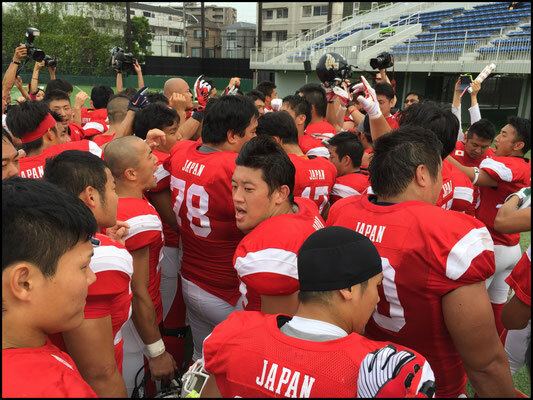 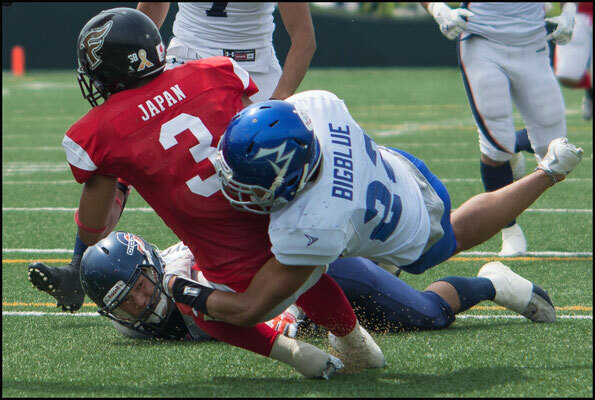 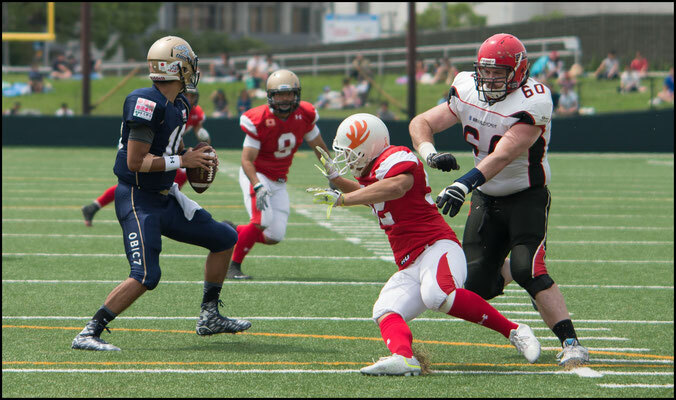 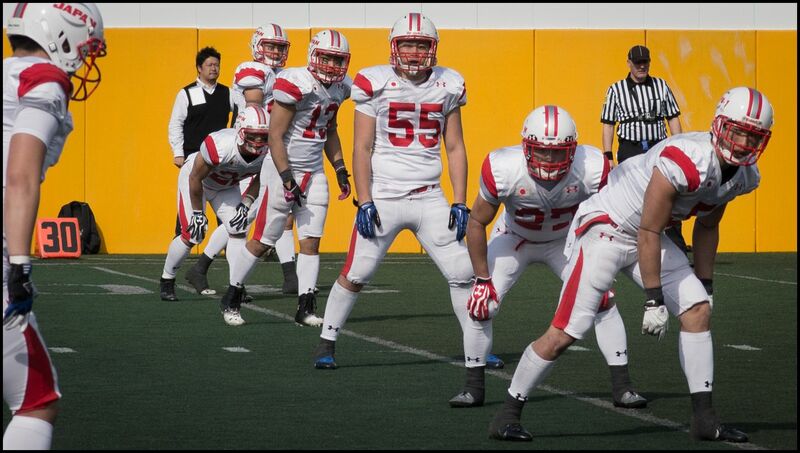 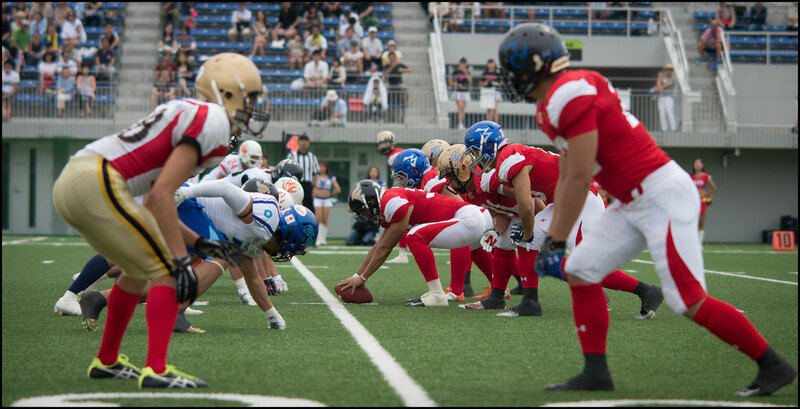 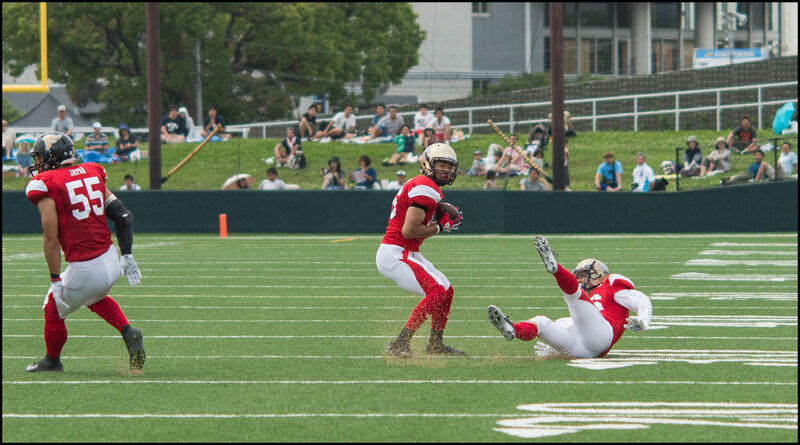 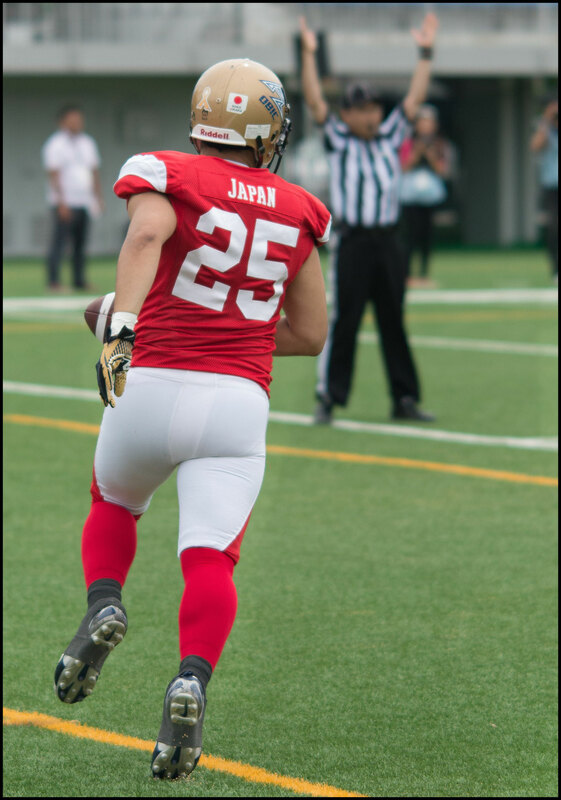 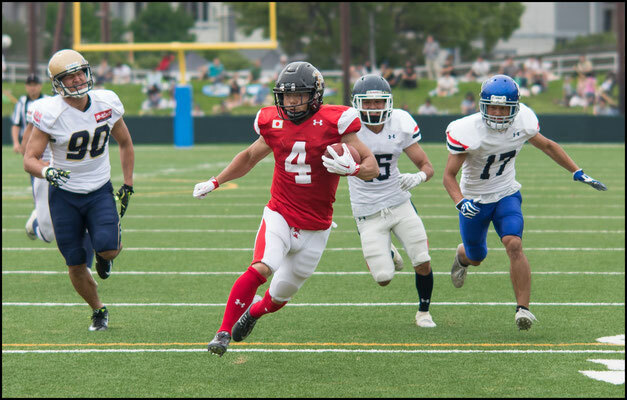 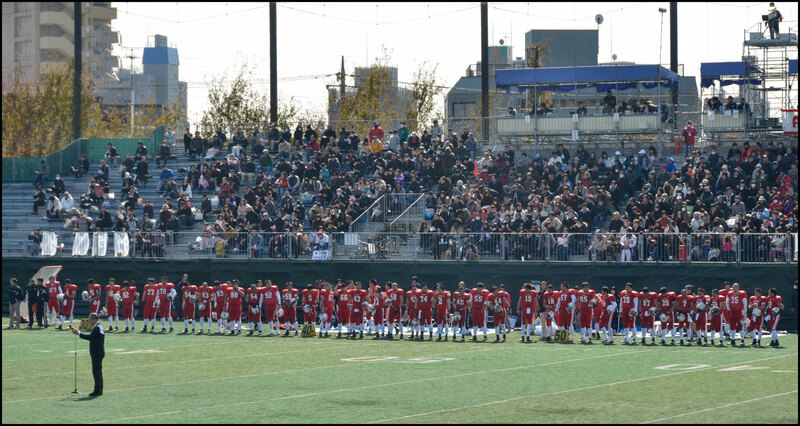 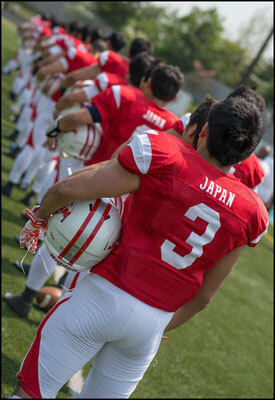 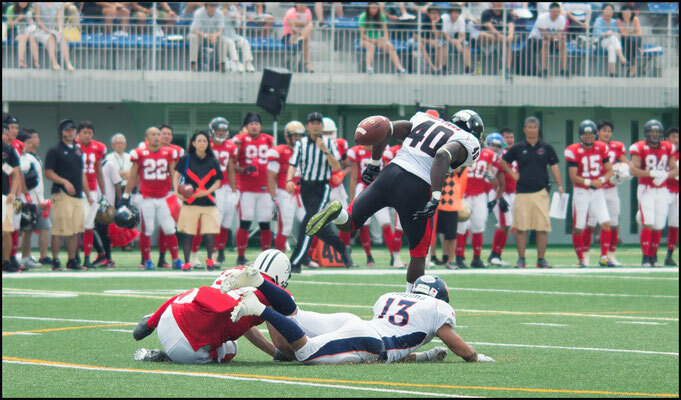 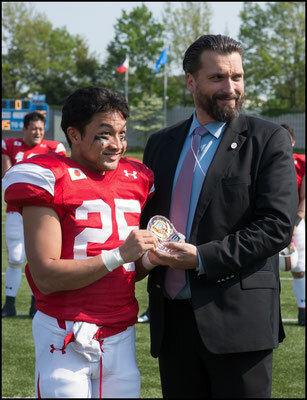 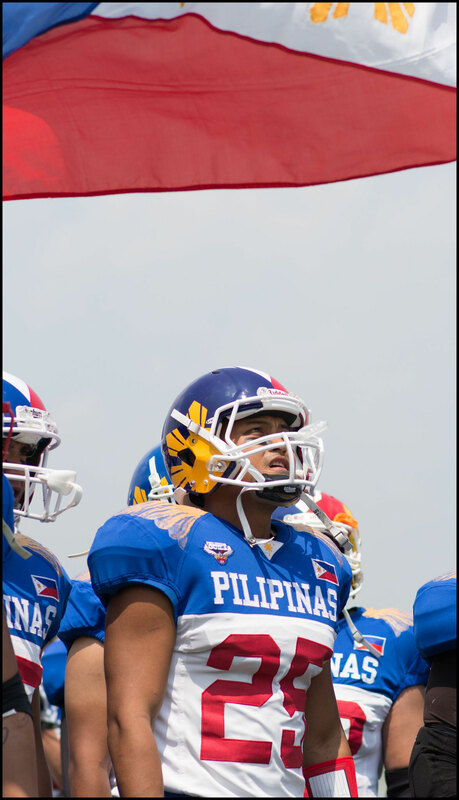 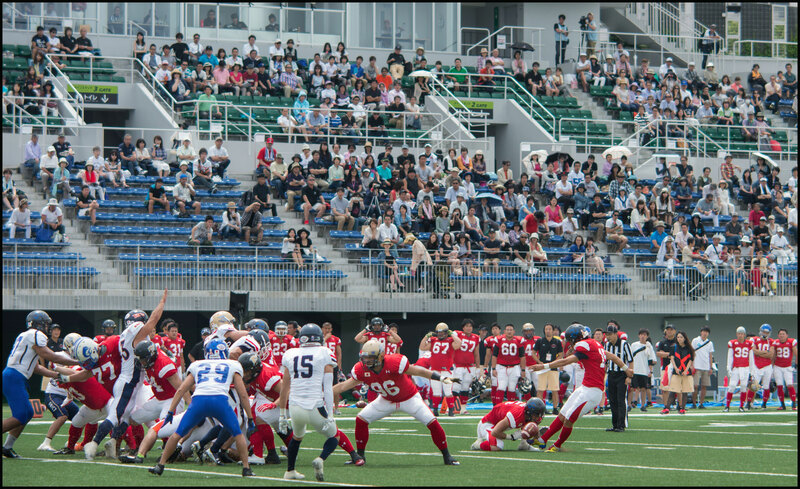 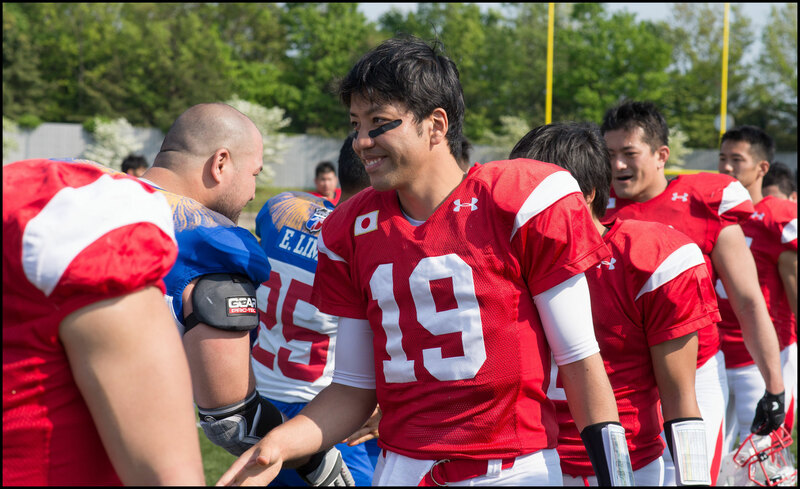 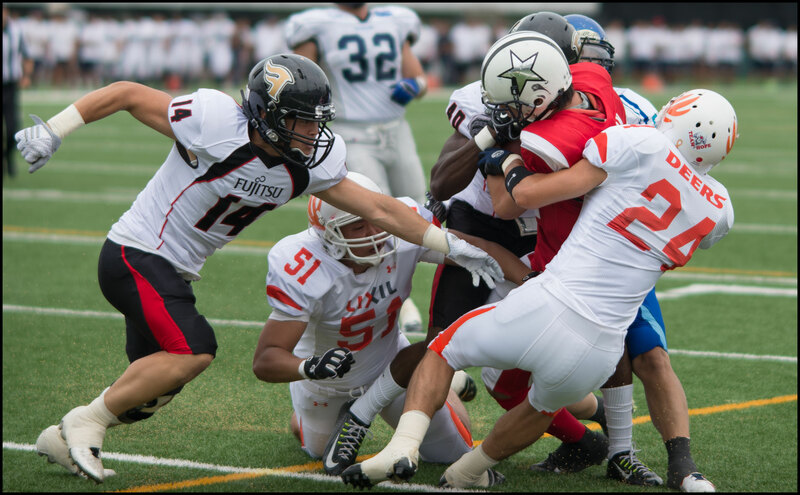 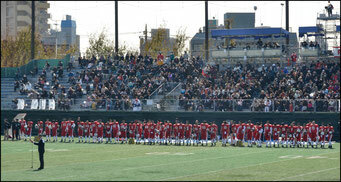 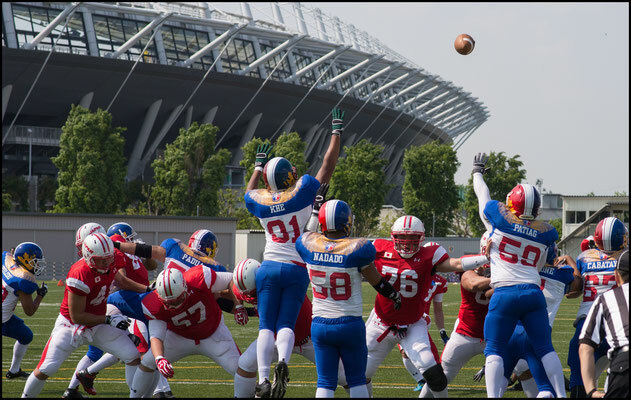 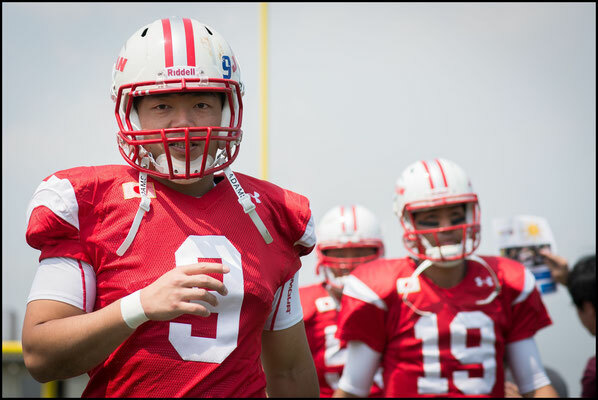 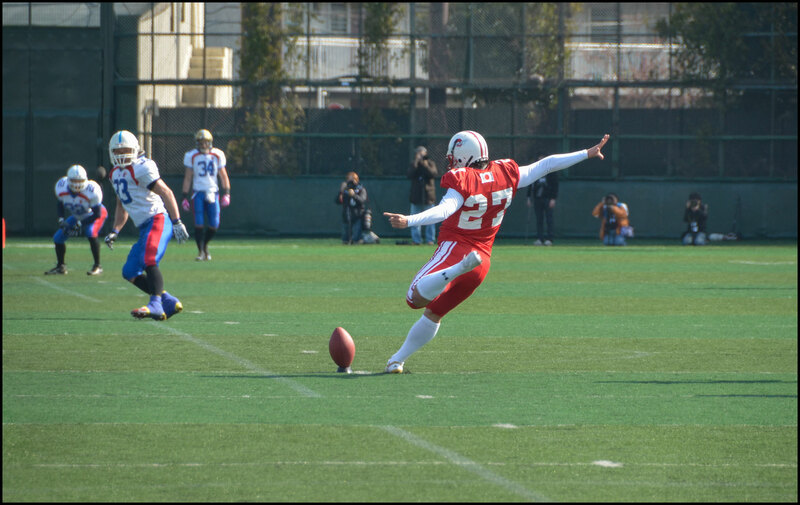 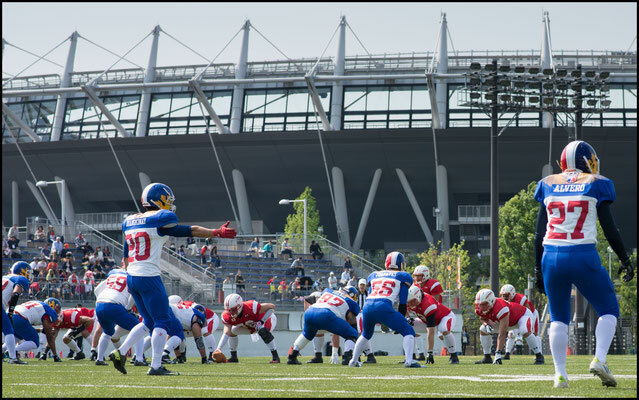 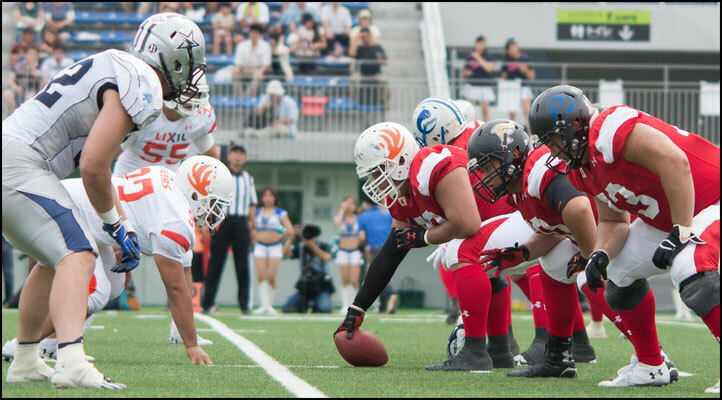 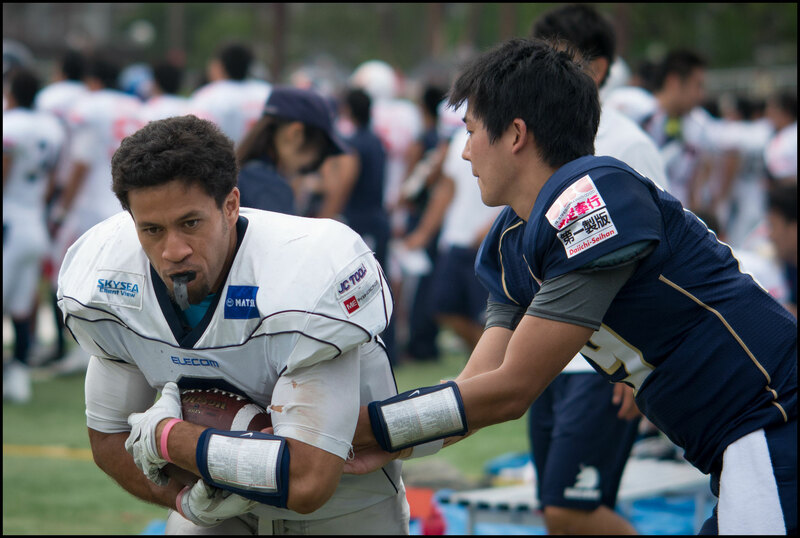 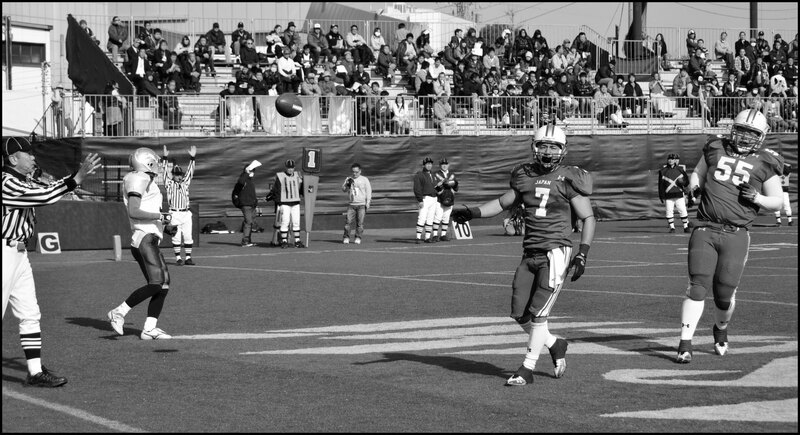 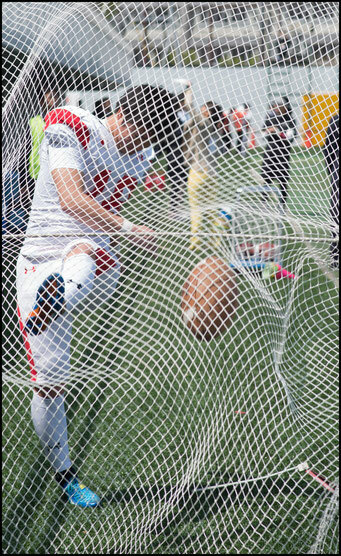 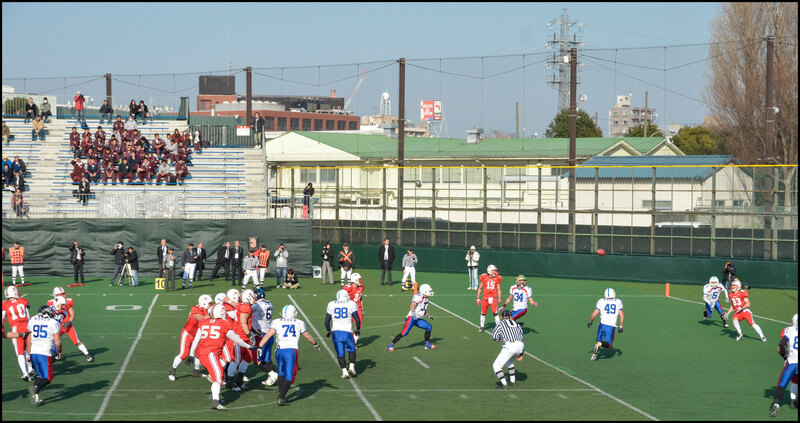 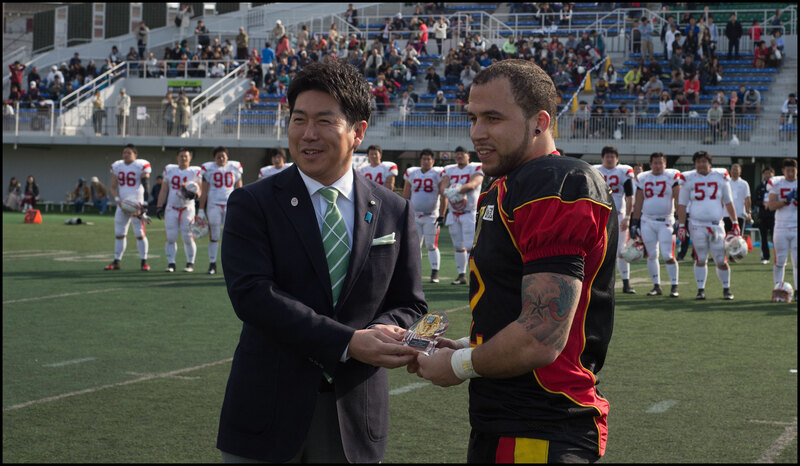 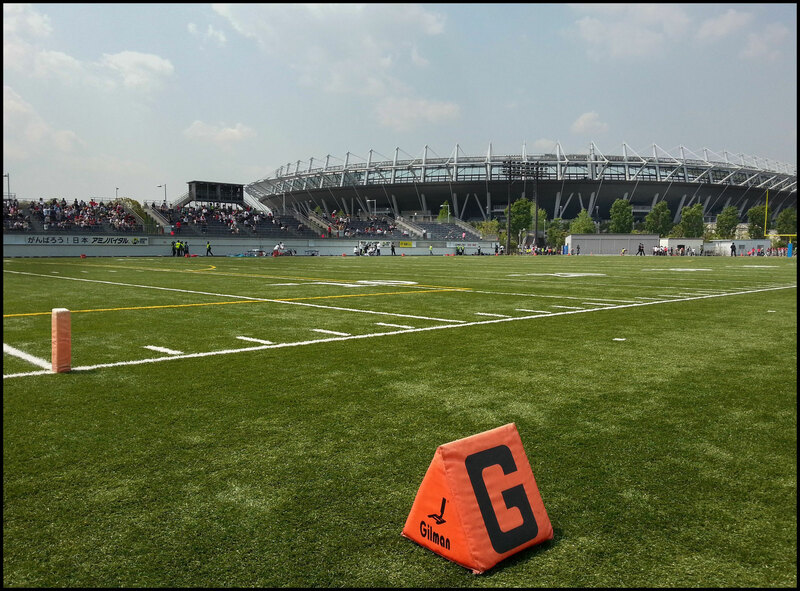 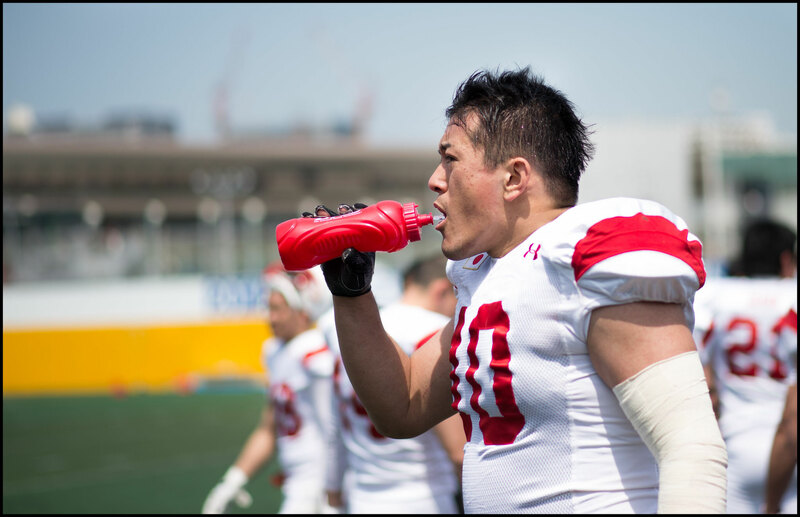 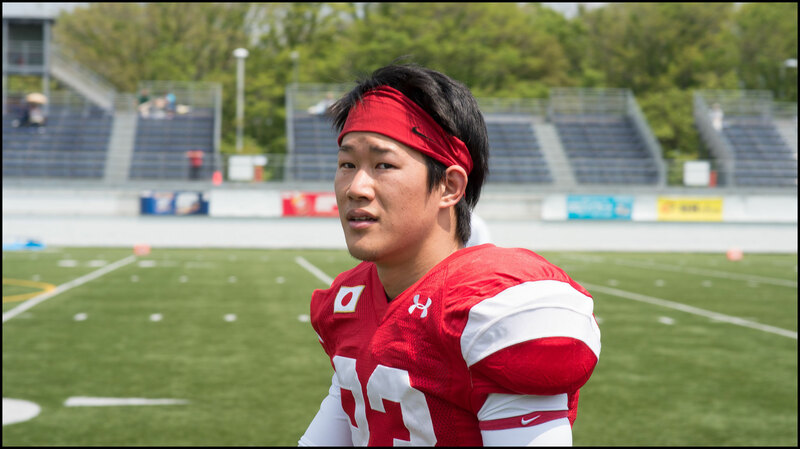 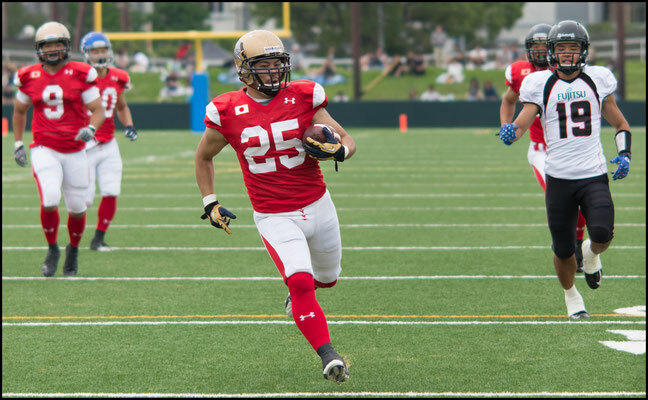 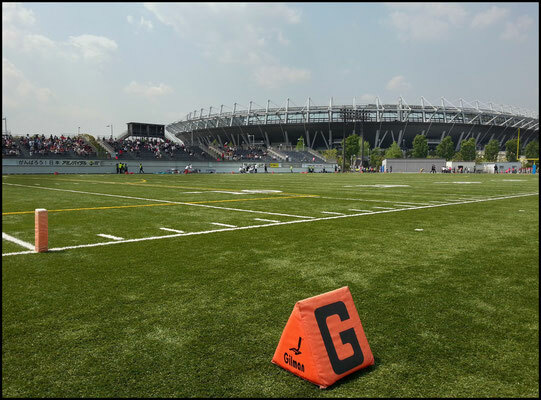 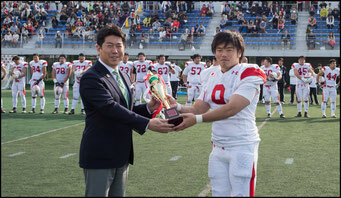 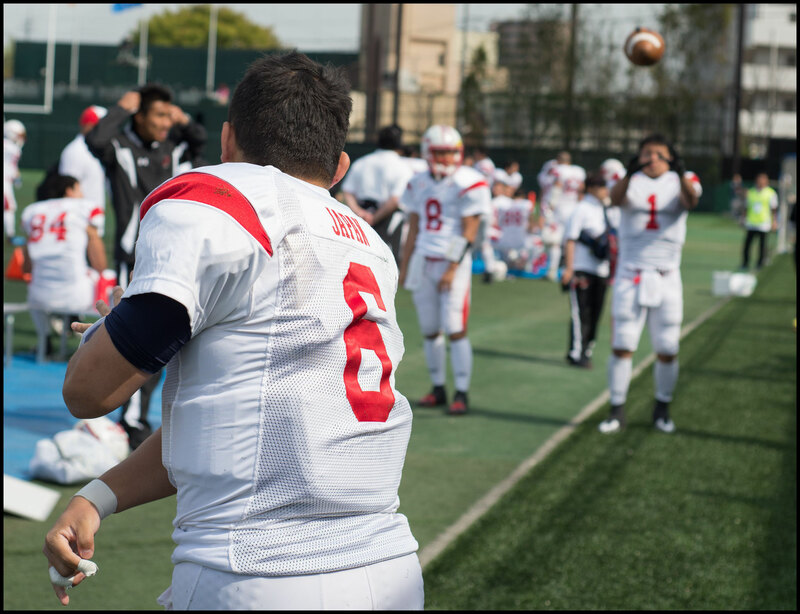 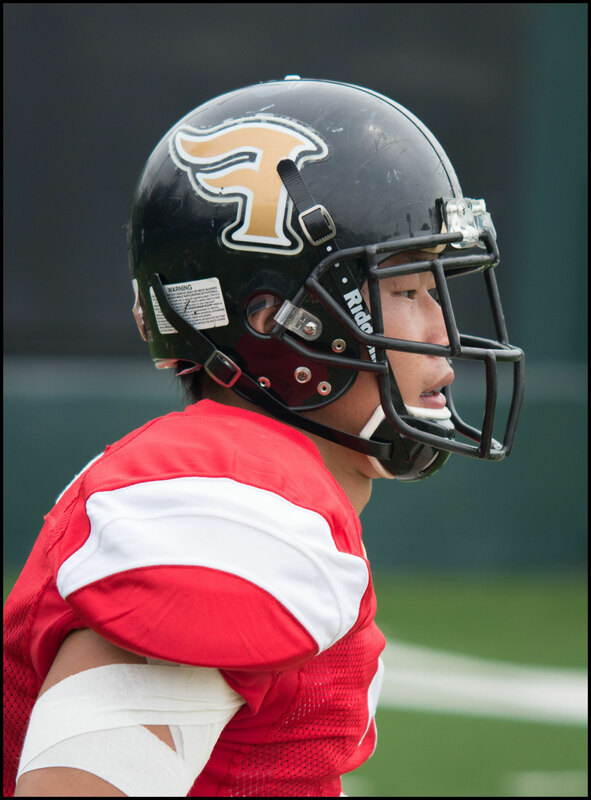 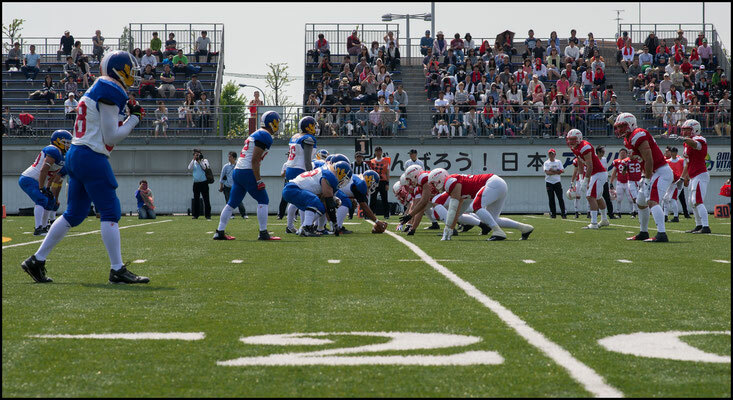 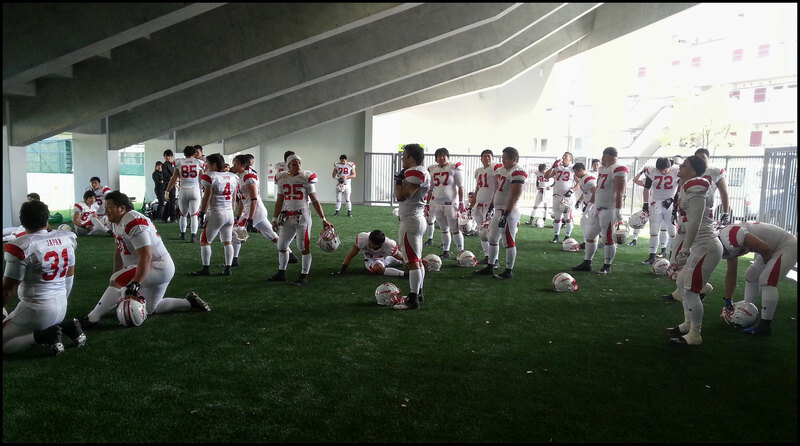 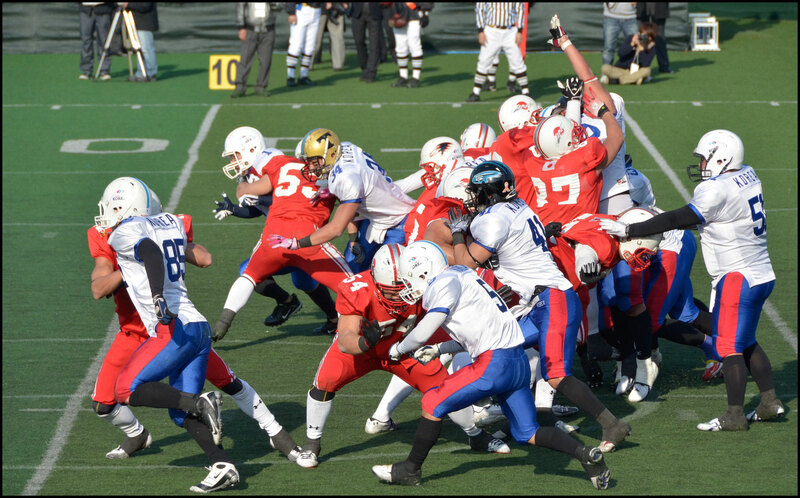 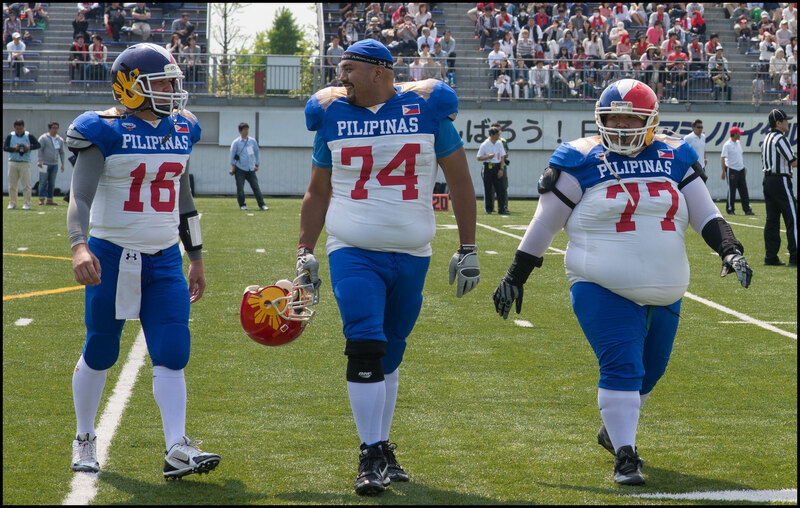 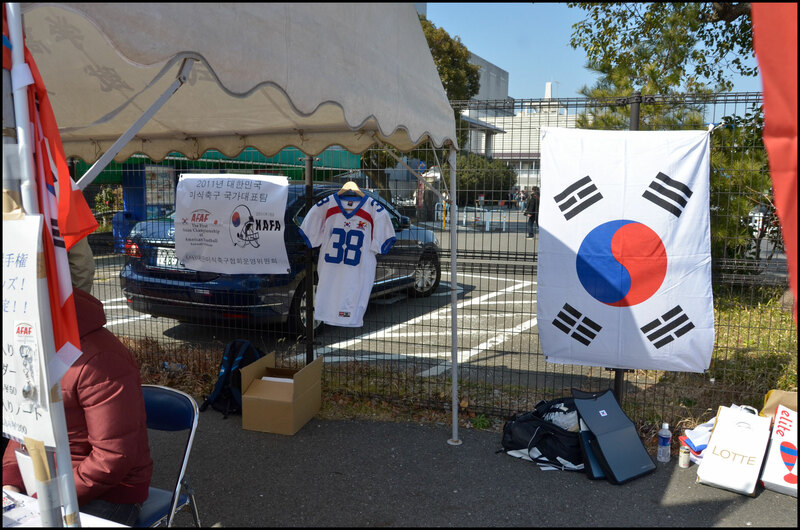 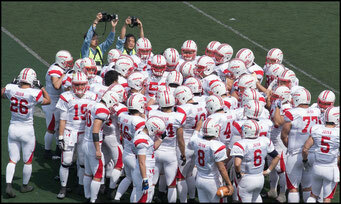 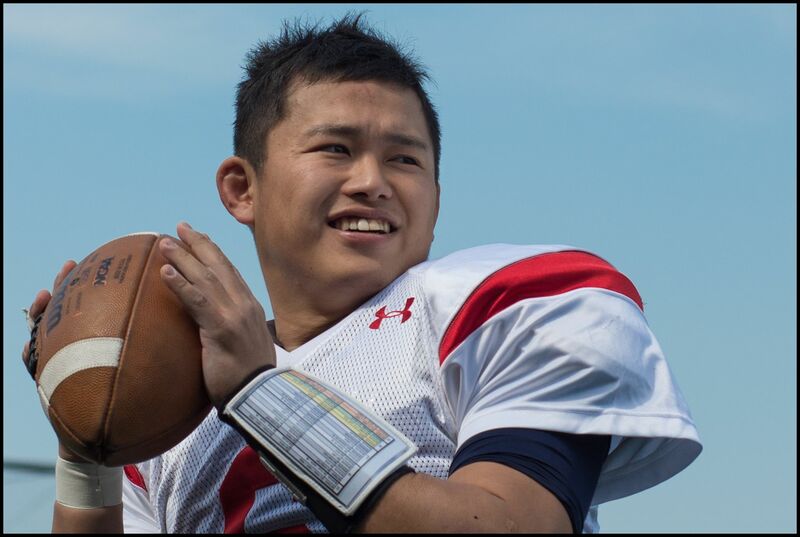 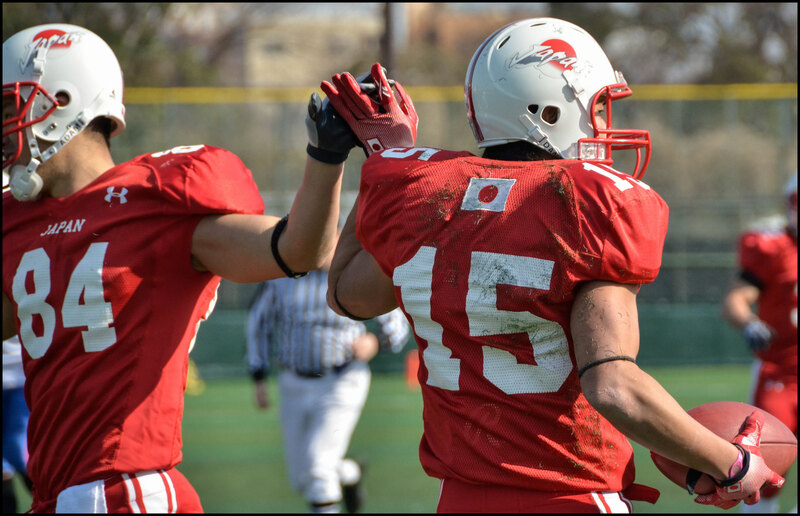 Japan advanced to next years IFAF World Championship with an 86-0 annihilation of the Philippines on Saturday at Tokyo's Amino Vital Field. 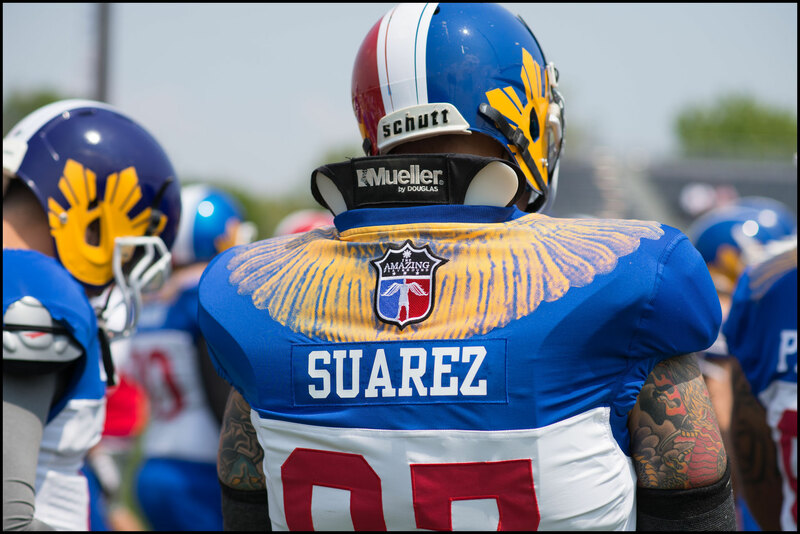 The Aguilas were outclassed in all phases of the game on their international debut, conceding scores in almost every possible way. 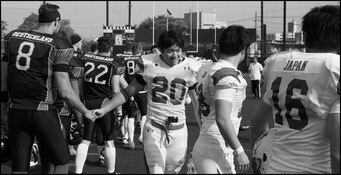 It was the highlight of the day for a team that, despite playing hard to the end, never really stood a chance against the two time world champions. 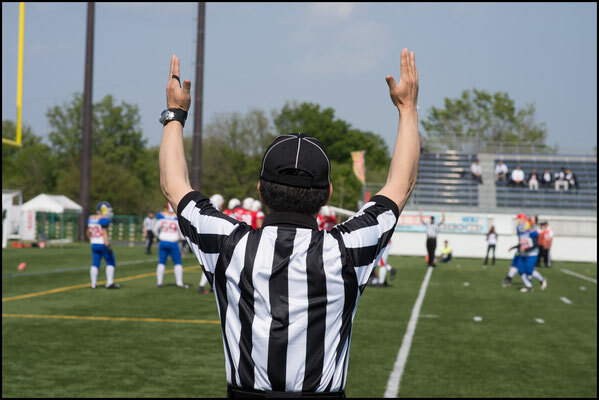 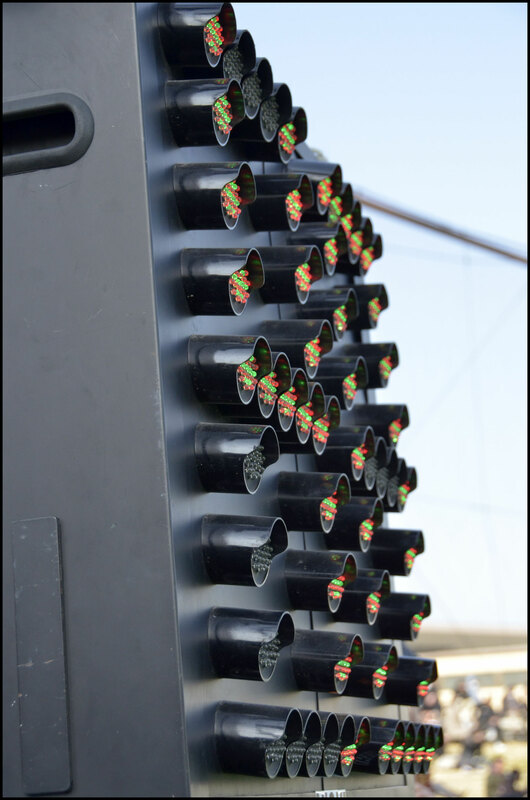 In fact when Japan scored a fifty-yard touchdown on its very first play and another on its third, the only question seemed to be would they put up 100 points. 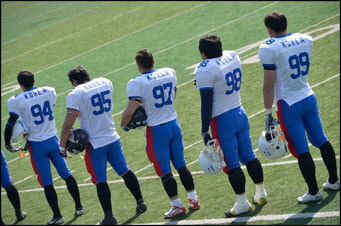 That didn't happen only because the home side chose to run out the last two minutes rather than go for triple digits. 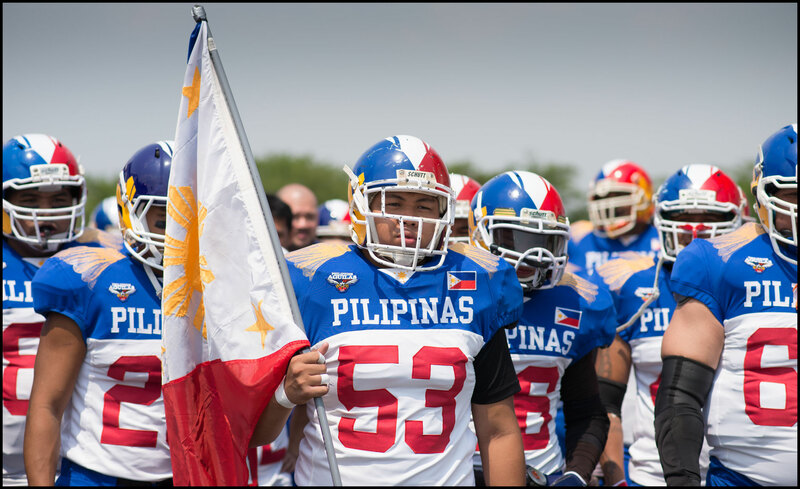 The mauling didn't seem to dampen the spirits of the Philippine players as they remained standing, cheering each other on, shouting advice and encouragement until the final whistle. 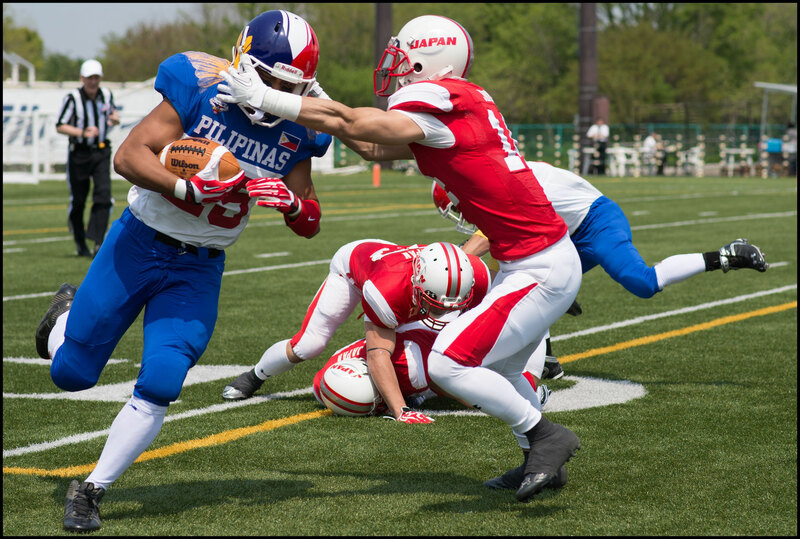 As against Germany the week before, the speed and aggression of Japan's front four was too much for the Philippine’s offensive line. 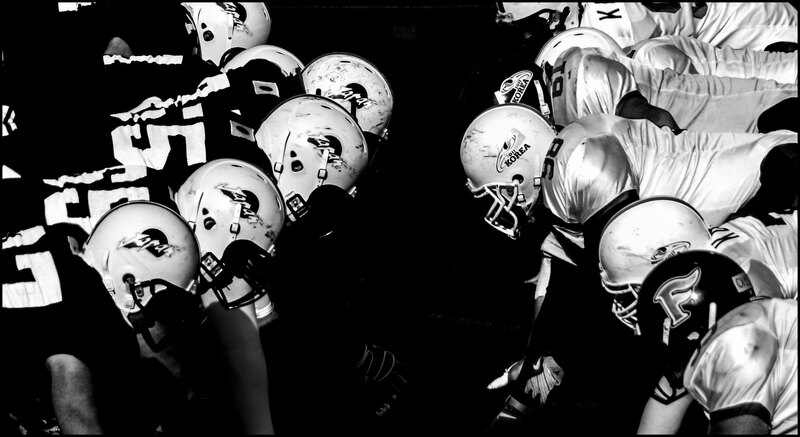 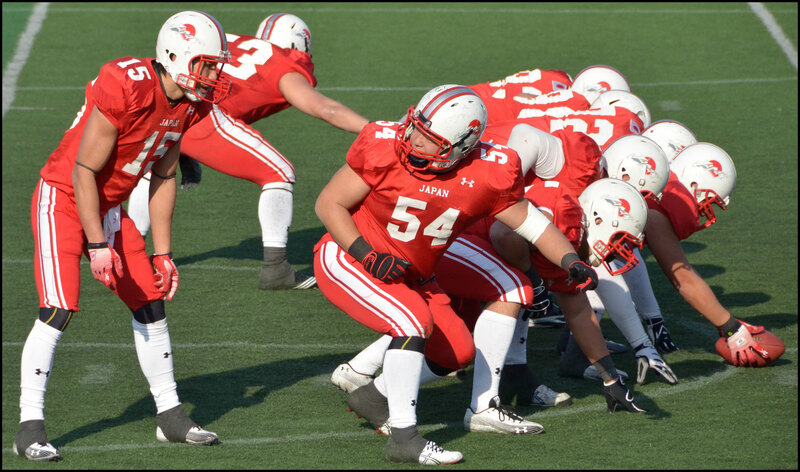 The visitors had size and weight but inexperience meant the Japanese defensive tackles were constantly past them before they could set their blocks. Things weren't much brighter on the other side of the ball. Japan faced 3rd and 21 at one stage and you wondered if the Philippines could get their first stop. 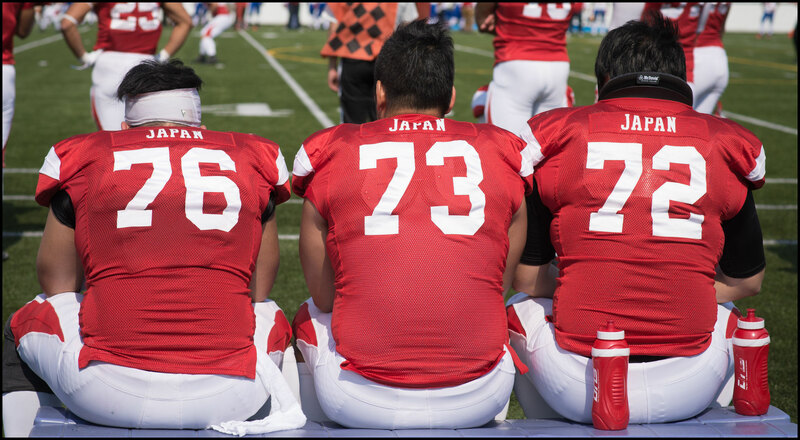 They couldn't. 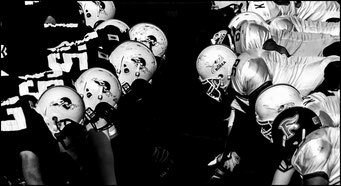 A lack of players didn't help matters. 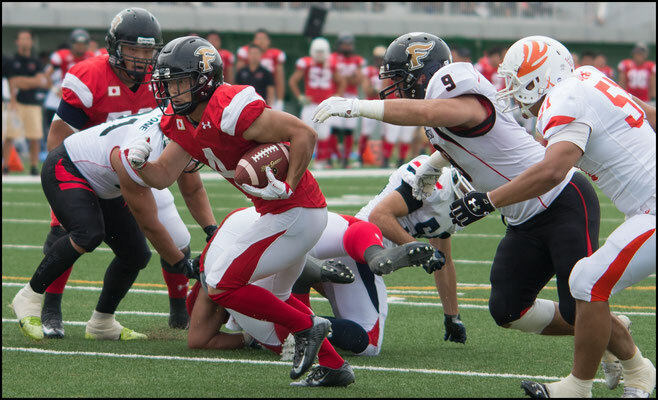 Whilst Japanese coaches were able to call for "B team" and "C team" early on, the Aguilas were missing some of their best players forcing the starters to stay in much longer. 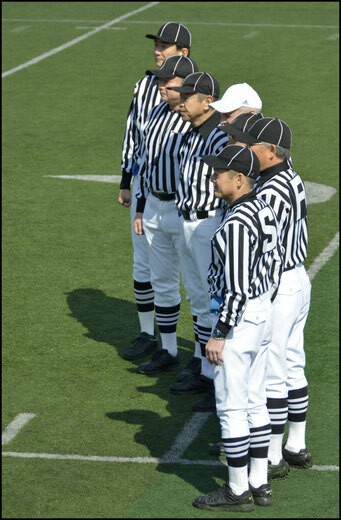 That didn't affect their enthusiasm however. 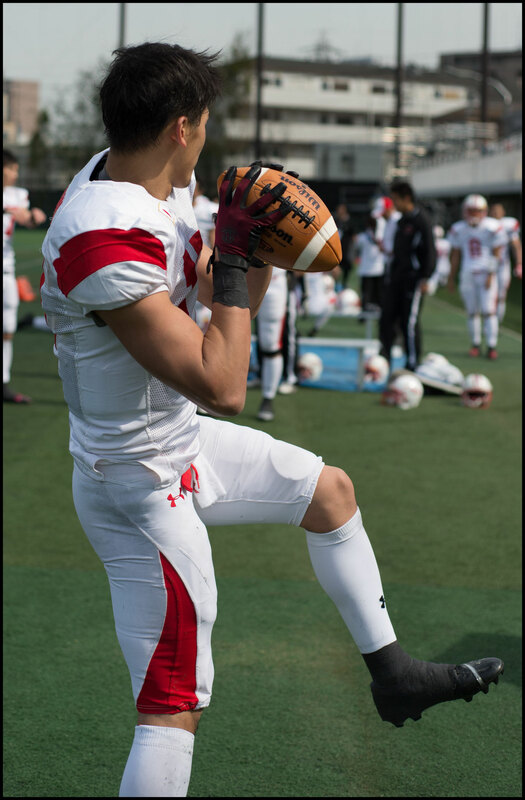 "It's going to be a long day,” said guard JJ Cocjin coming off the field at one stage before bellowing "but I don't care!" 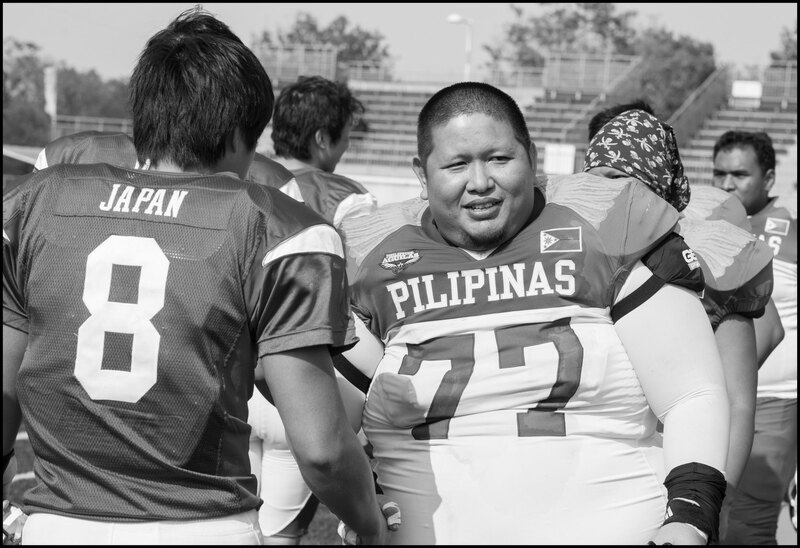 Cocjin, listed at 160 kilos, was one of the largest men on the field but with several undersized skill players in the Philippine ranks, including 157cm RB Karl Fernandez Japan found themselves in the unusual position of being physically dominant as well as technically superior. 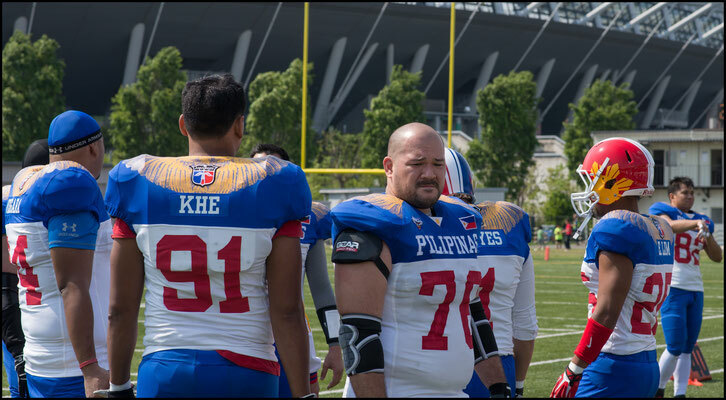 This was especially pronounced in the fourth quarter as the Philippines lack of match practice began to show. 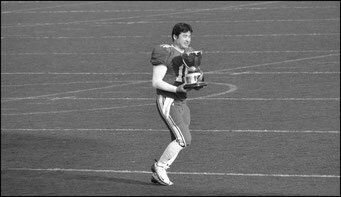 Japan's defense started to resemble the '85 Bears as Hirasawa sliced through for a sack on 4th and 7, and Tomita laid a career highlight hit behind the line on Fernandez. 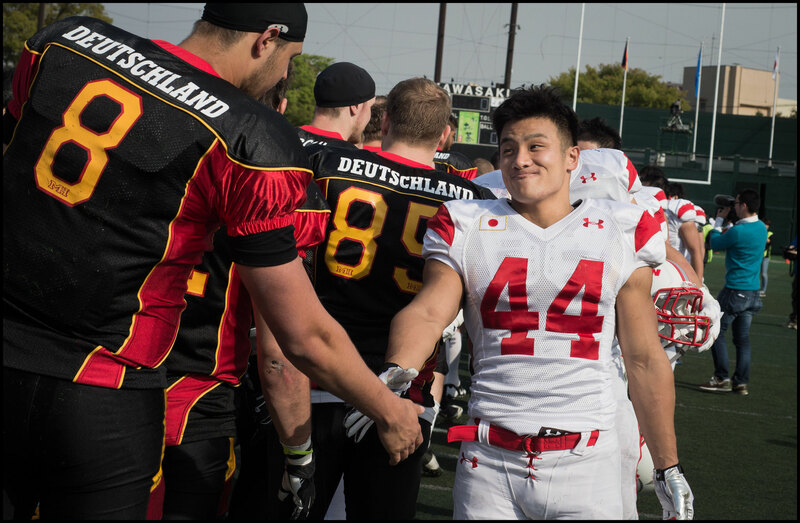 Players mingled laughing and thanking each other after the final whistle however and there was a sense that despite the scoreline this was a good outcome for both sides. 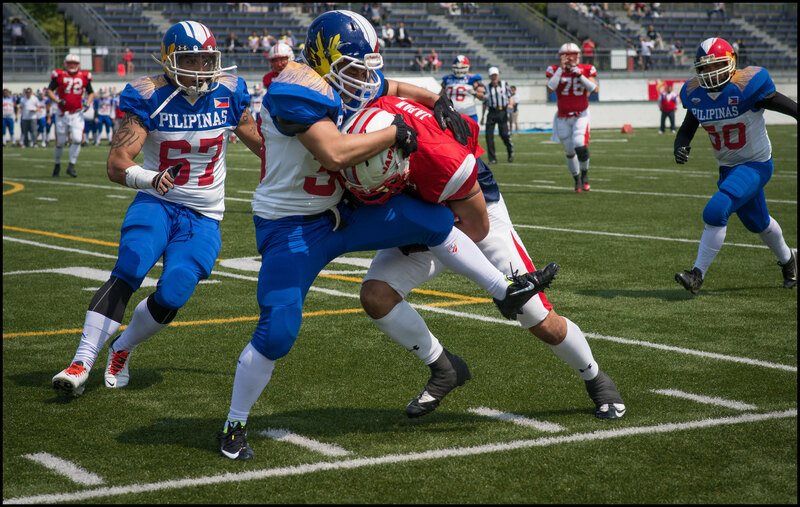 The Philippines successfully completed their first ever international game and Japan qualified unscathed for their fifth straight appearance at the World Championship, while managing to give valuable playing time to younger players on the fringes of the squad. 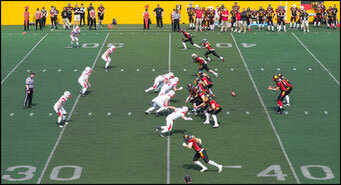 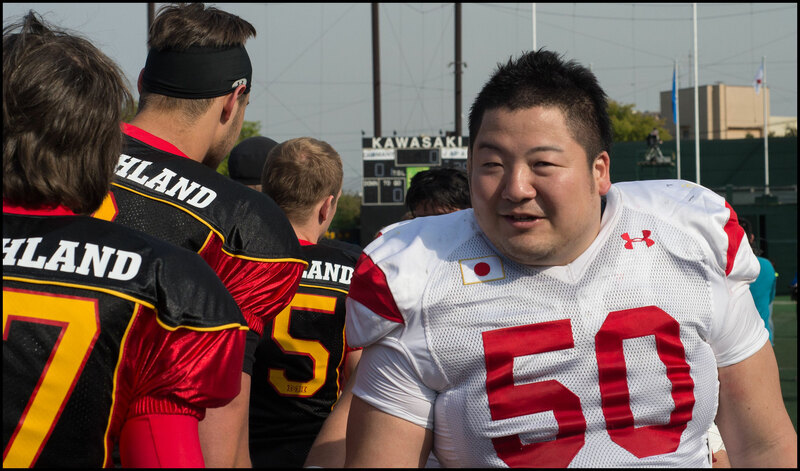 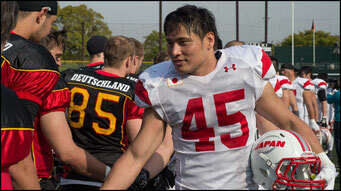 Japan underlined its status as top dog outside North America with a comprehensive 38-0 win over Germany in Kawasaki on Saturday. 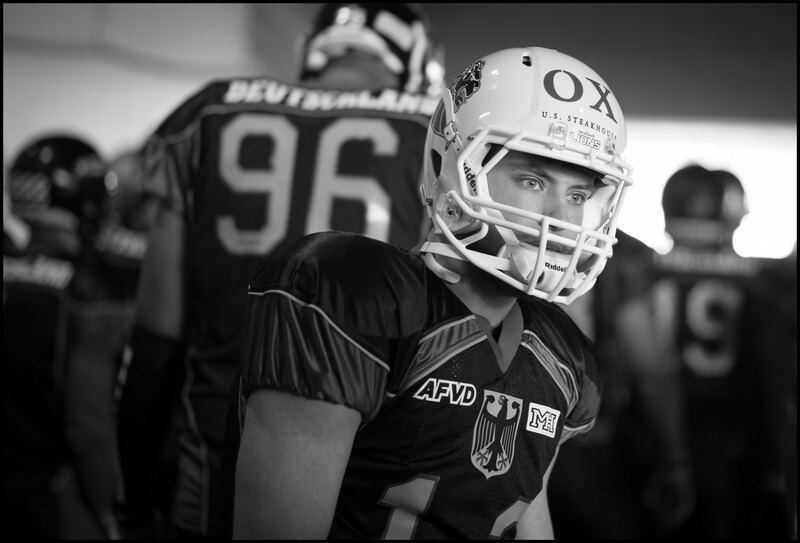 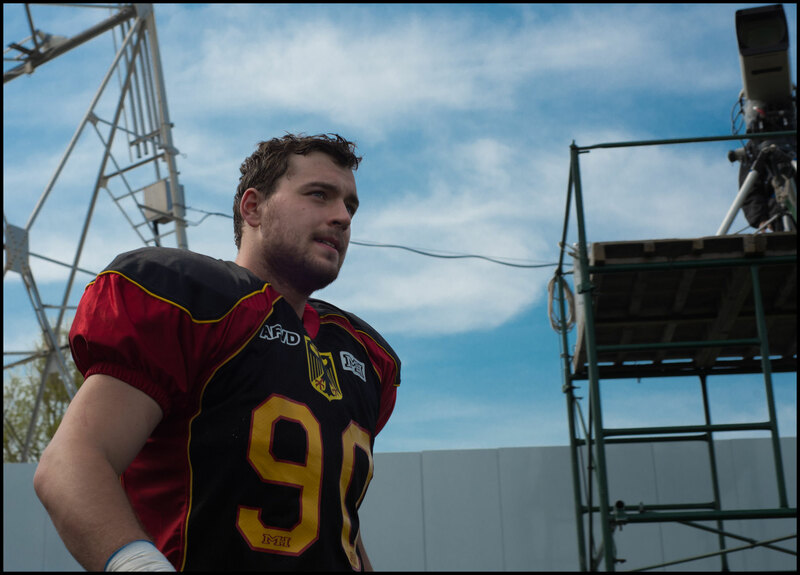 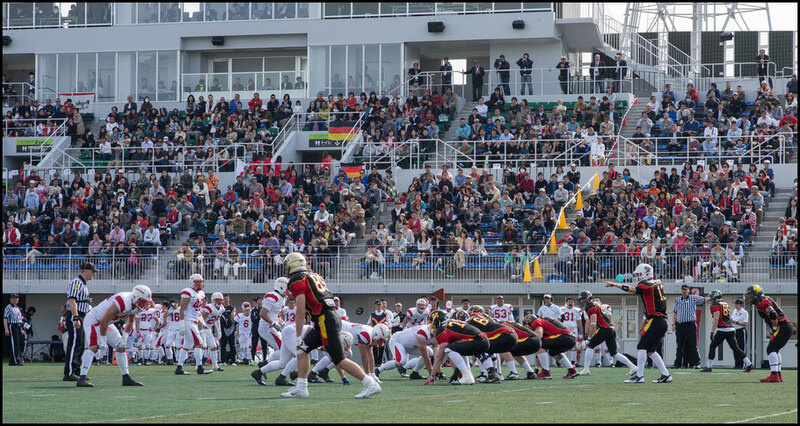 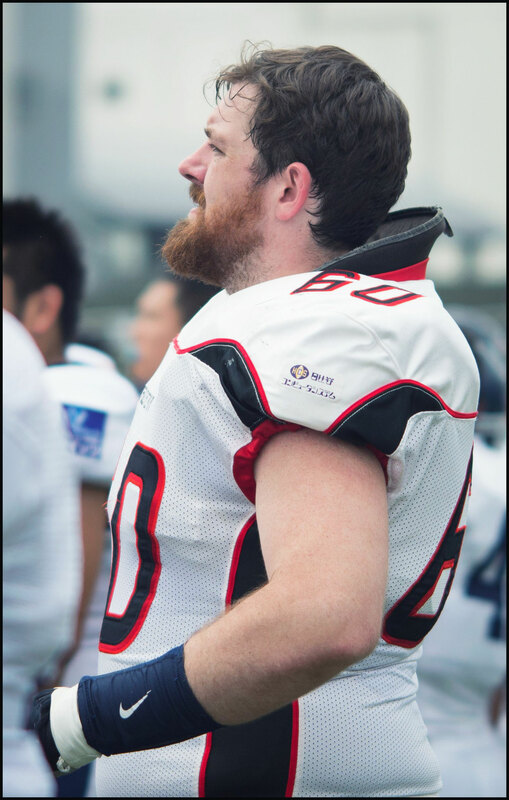 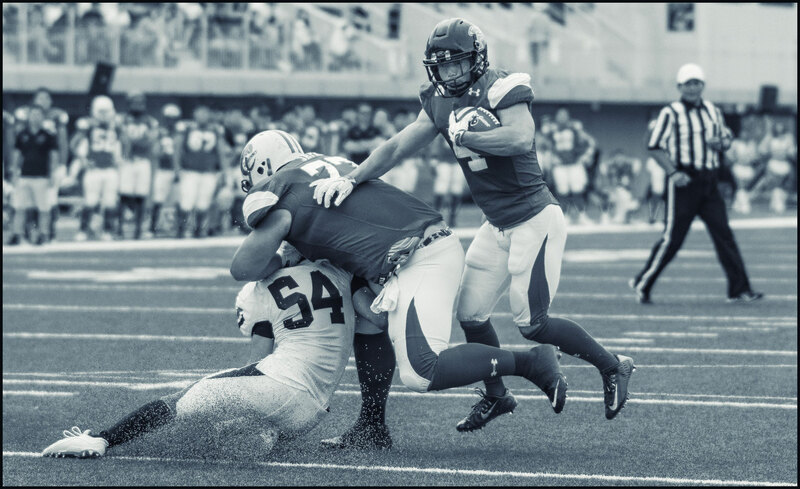 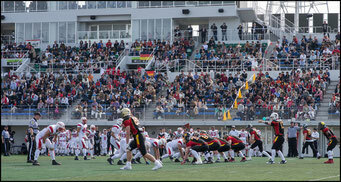 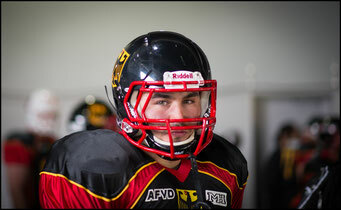 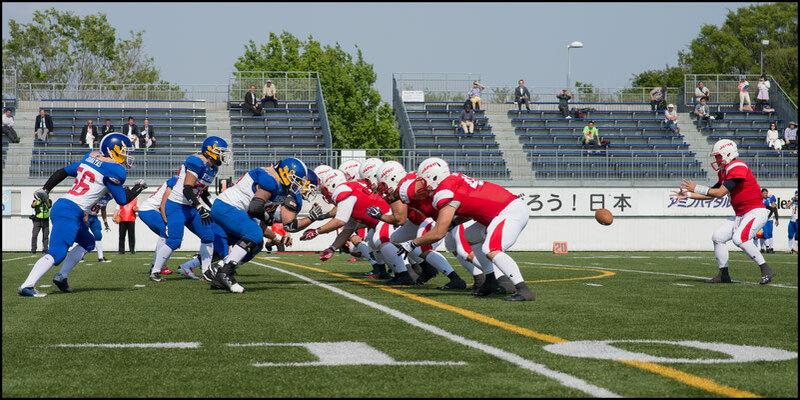 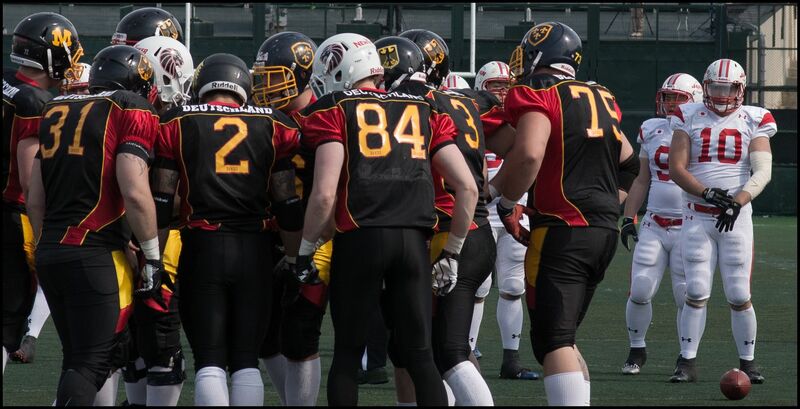 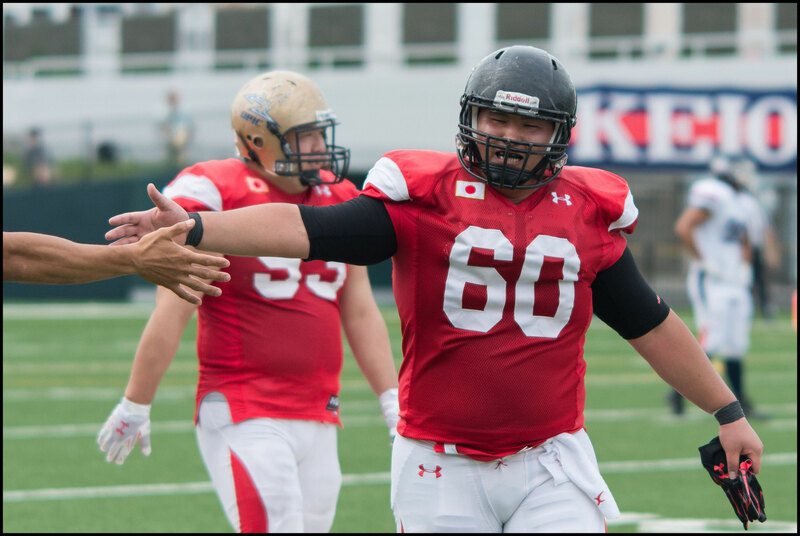 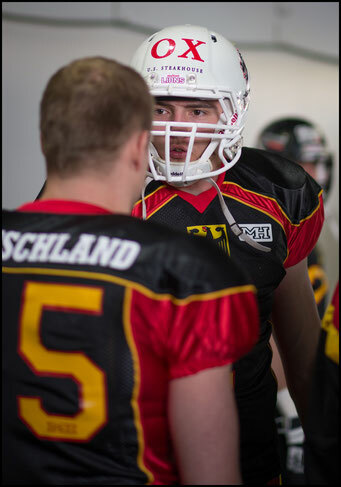 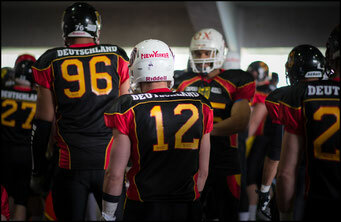 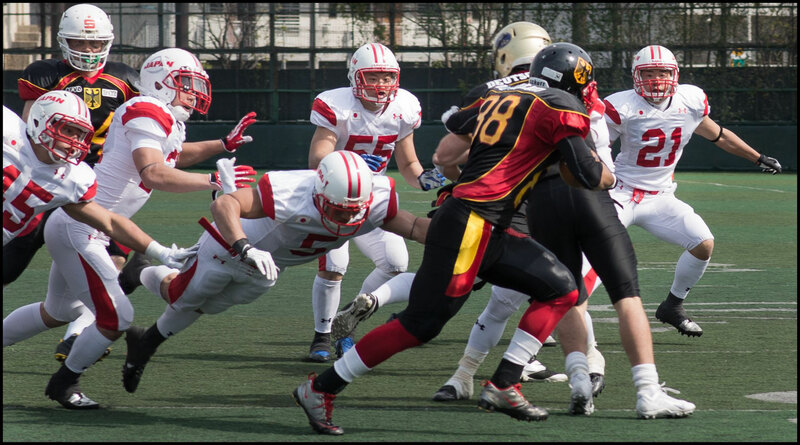 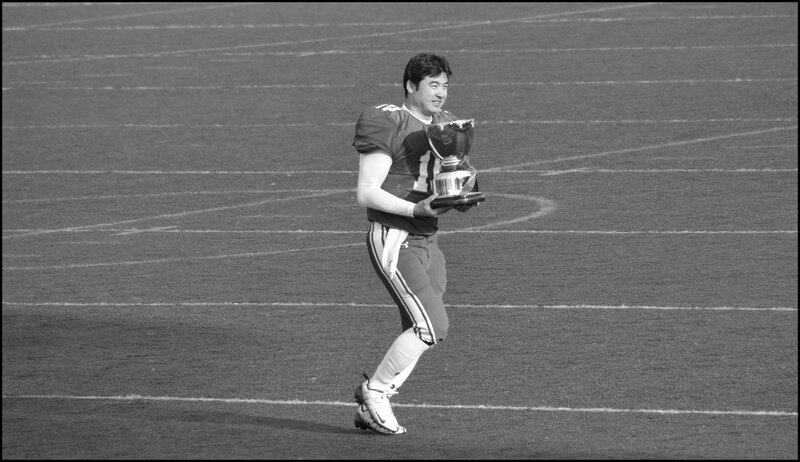 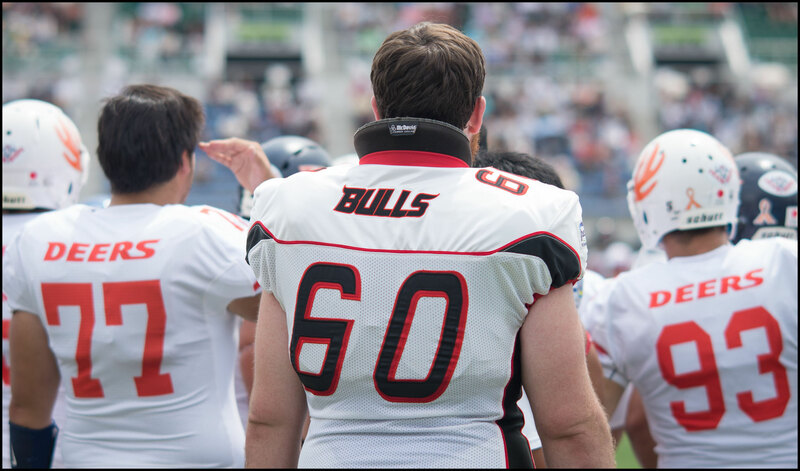 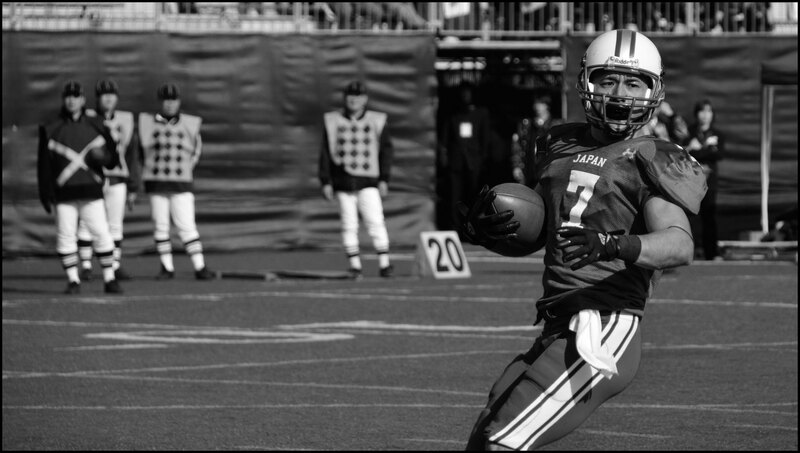 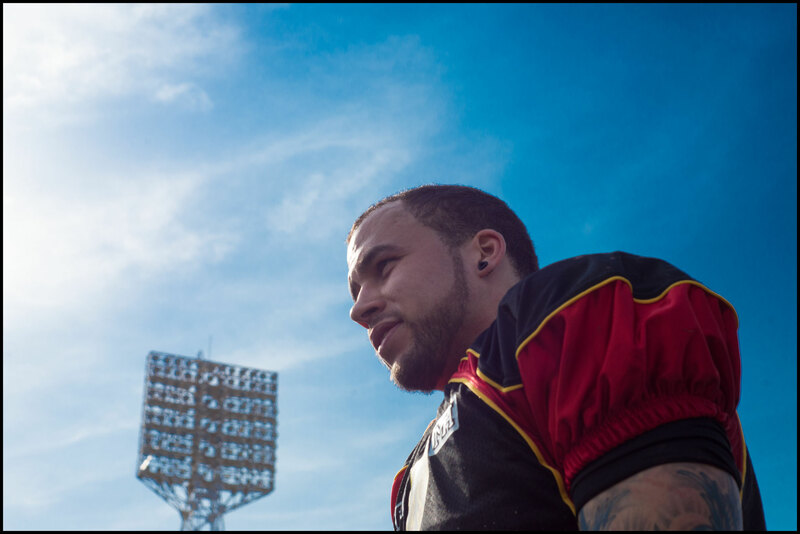 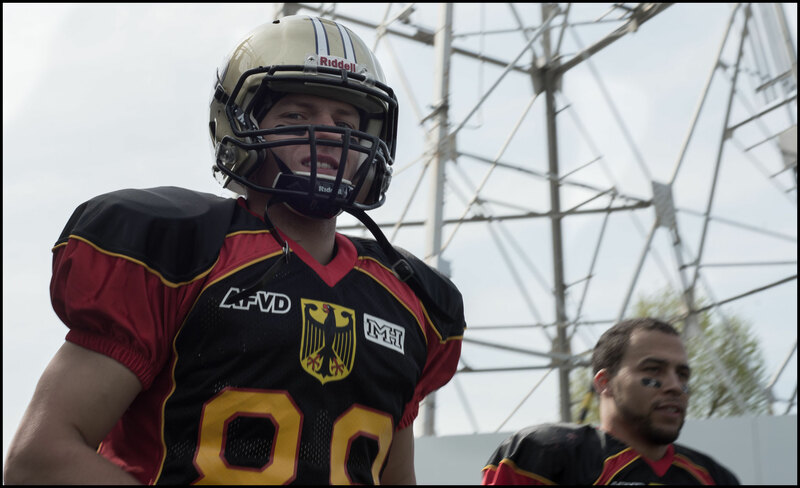 The European powerhouse kept the game within reach until the fourth quarter but its offense had no answer for a Japanese D-line that harried and harassed quarterbacks Ehrenfried and Friese all game. 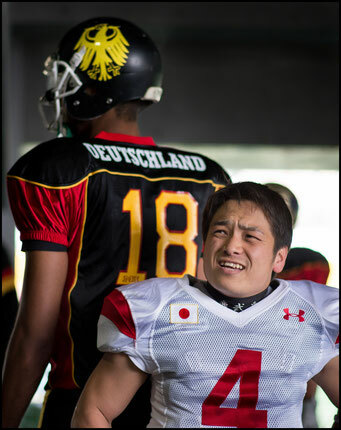 Unable to get anything going on the ground, Germany strangely chose not to exploit its receivers height advantage early on instead going with the read option and quick slants. 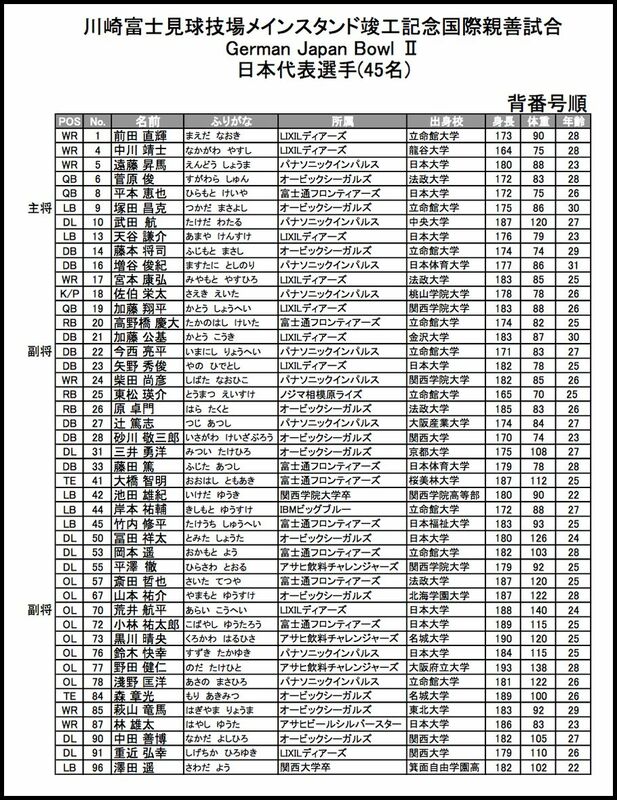 That strategy was never going to work against a faster and younger (39 of 45 Japanese players were under thirty) defense. Whenever it seemed like Germany might get something going, penalties, fumbles or dropped balls derailed drives. 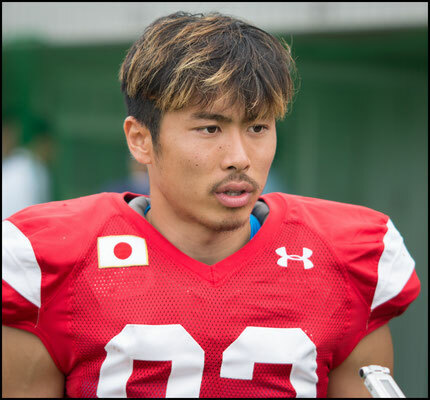 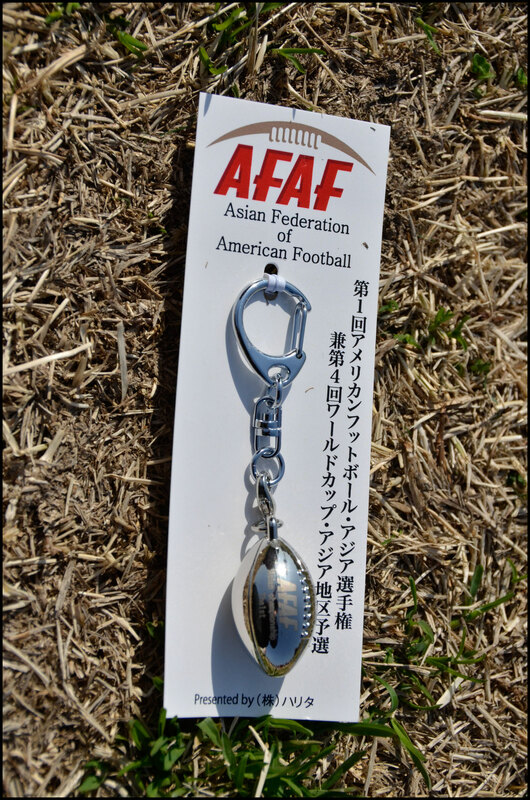 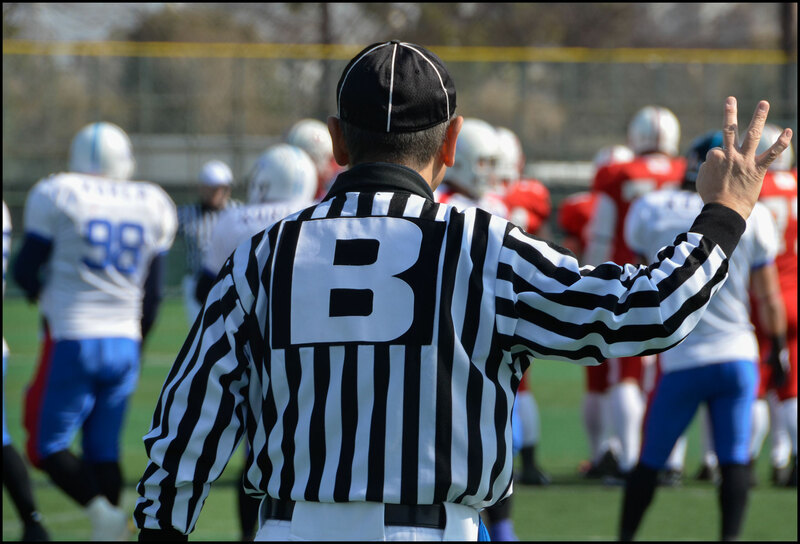 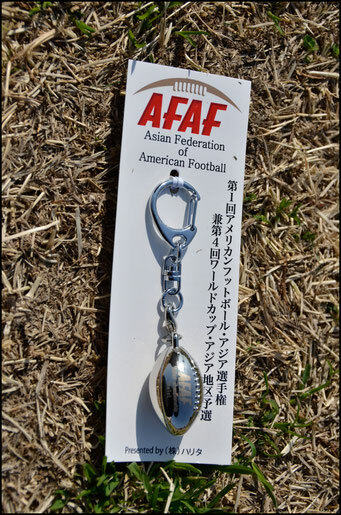 Japan on the other hand had no trouble moving the ball, marching down the field on its first possession in nine plays and scoring on a six yard Sugawara pass to wideout Naoki Maeda. Team Nippon could have put the game away early but botched snaps on their next two drives meant they had to settle for a 14-0 half time lead after a Kato to Hagiyama TD pass midway through the second quarter. 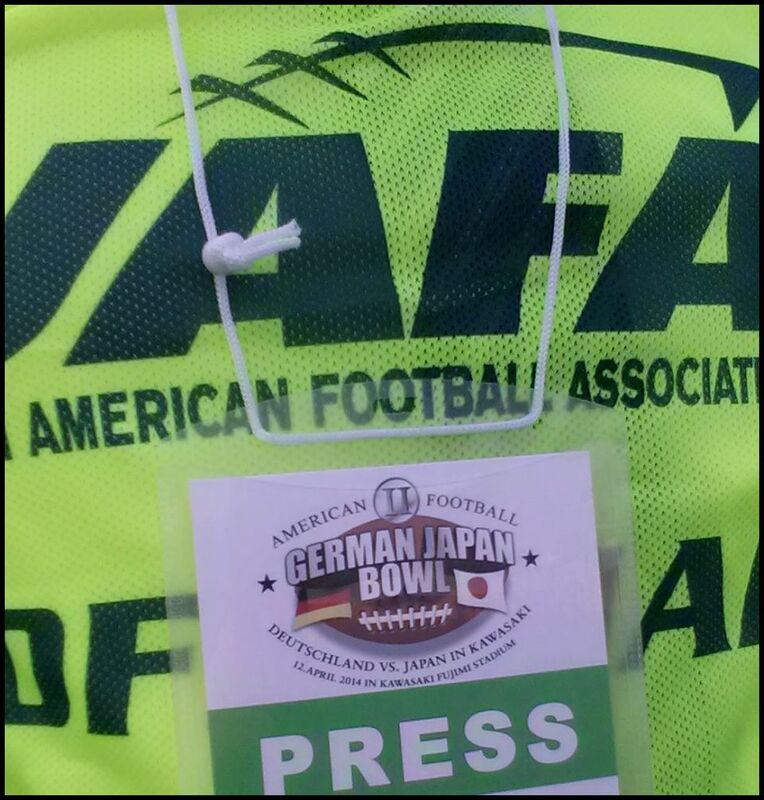 Germany played better at the start of the second half but Japan's front seven were winning individual battles all along the line and a huge sack on third down inside the red zone by defensive end Yo Okamoto put paid to Germany's only real scoring chance of the game. 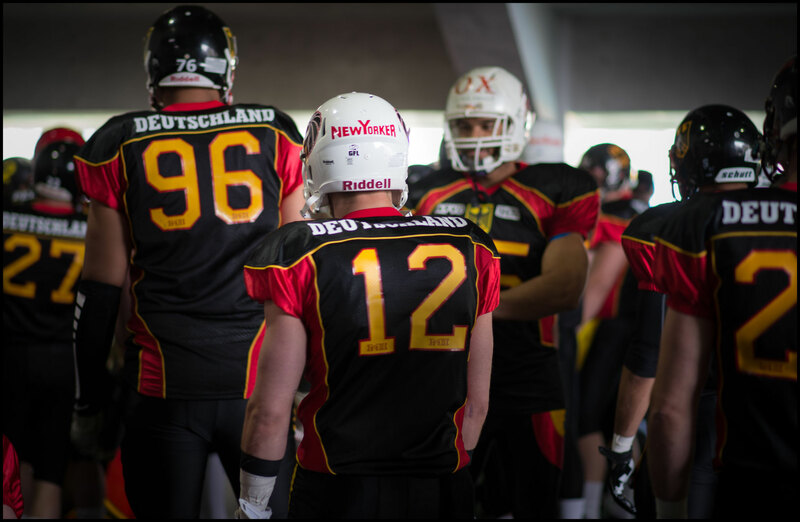 In the fourth quarter, down 24 points Germany had no option but to pass on almost every play. 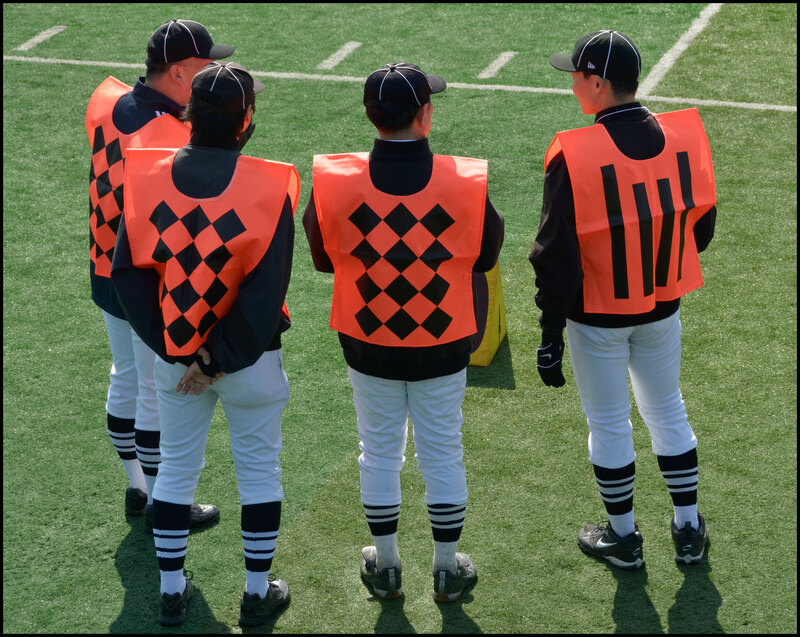 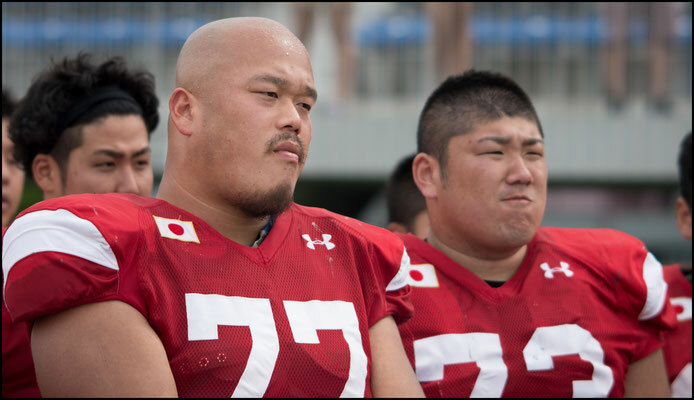 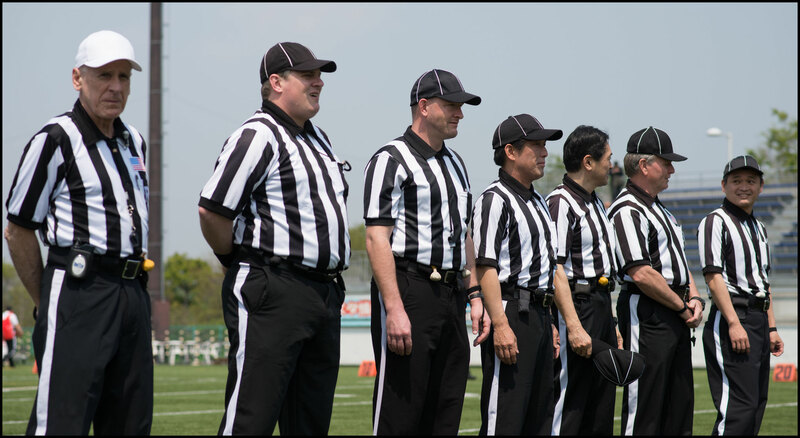 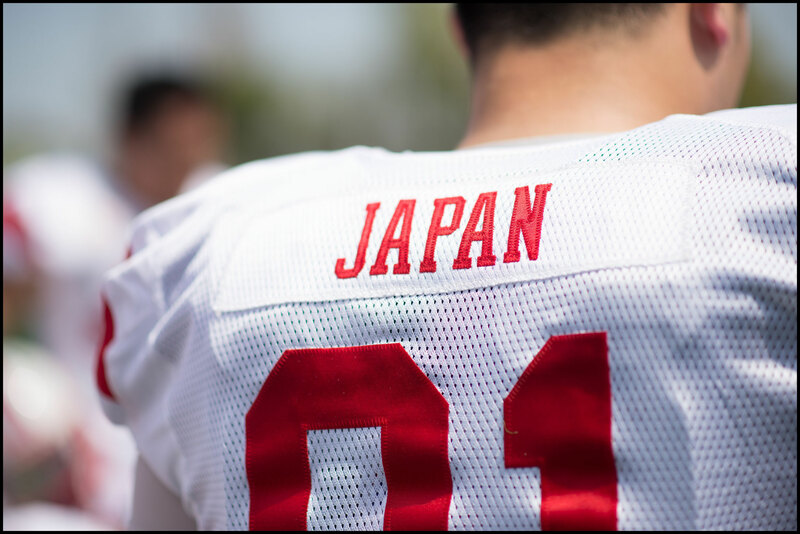 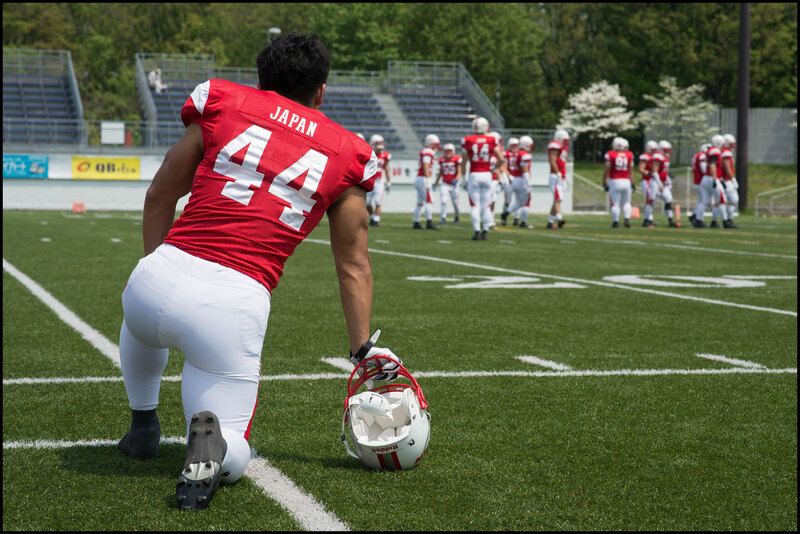 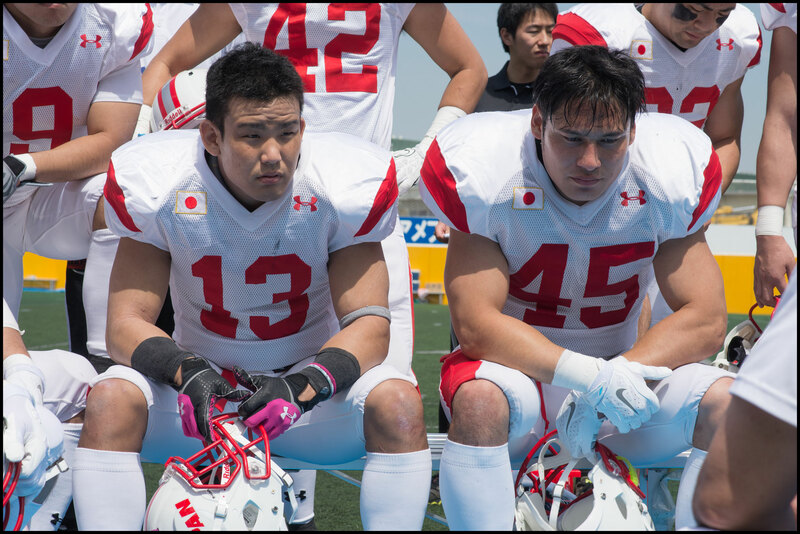 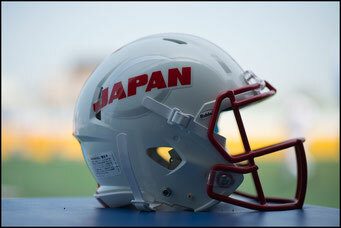 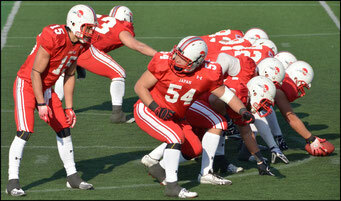 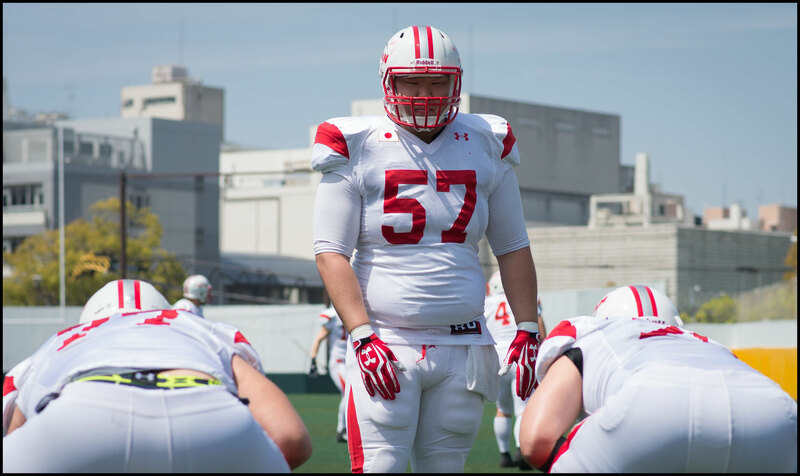 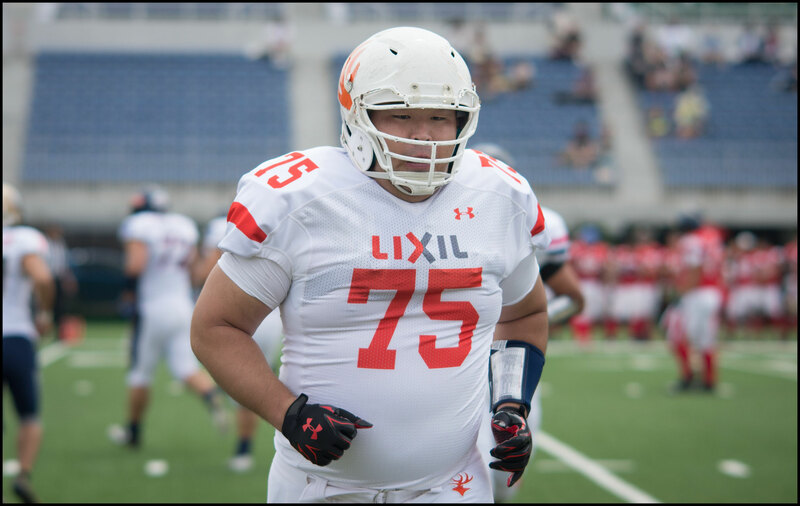 With the offensive line visibly tired and unable to stem the waves of white jerseys crashing through the subsequent hurried efforts were easy pickings for Japan's secondary. Two interceptions were followed by quick touchdowns as Japan made sure the score more closely reflected its dominance throughout. 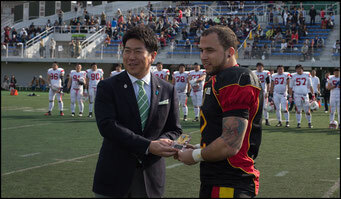 Photos: John Gunning - April 12th 2014: Fujitsu Stadium Kawasaki. 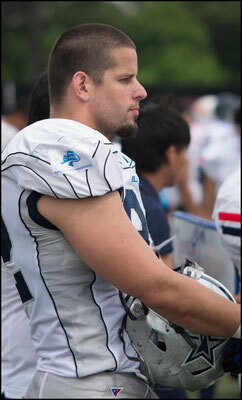 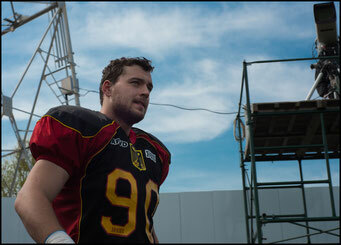 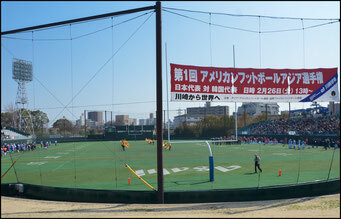 Photos: John Gunning - Feb 26th 2011: Fujitsu Stadium Kawasaki.